I am going to try to keep fond recollections of being young, and being able to be hot even when drenching wet, in mind as we enter the serious thaw of the Arctic. Talking politics too much just spoils the appreciation of the beauty. As we begin, you’ll have to forgive me for naming storms. (I’m not good at Math, and numbering them causes me problems.) In the map below “Follower” is pushing north from Canada, nosing high pressure off the Pole. 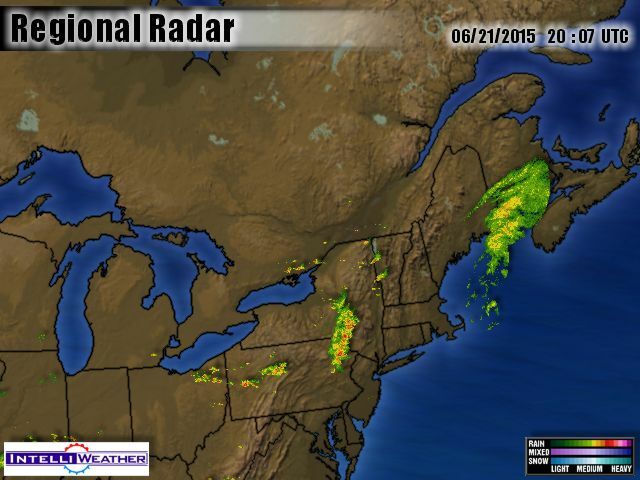 That high pressure had weak low pressure systems circling the Pole over the past few days. Northeast of Finland “Baltson” is brewing up and headed for the Kara Sea, in the Laptev Sea. “Balt” is merging with “Folfol”. Over towards Bering Strait “Folfolzip” is coming north and entering the picture. 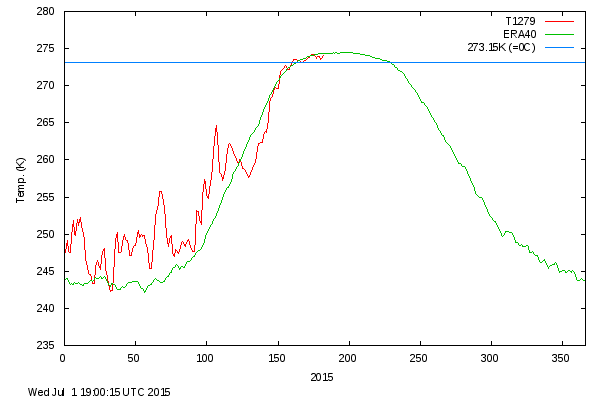 More interesting is how the below-freezing temperatures up at the Pole follows the storms. It is interesting to note that most of the subfreezing temperatures are south of Latitude 80°, and therefore not included in the DMI graph of temperatures north of 80°. While that graph shows the thaw, it states temperatures are slightly below normal, for the moment. In theory the Pole should have a slight increase of energy at this time of year, with the sun up 24 hours a day, and therefore it interests me when temperatures decline. A commentator suggested the chilling might be due to evaporative cooling as rain falls through the arid air, until it drops below freezing and becomes snow. I increasingly agree this plays a part, but suspect some sort of other stuff involving the tropopause is involved, however I don’t want to go there tonight. Talking that way makes me sound sciency and pretentious. Actually I’m just a guy with fond recollections of slush. 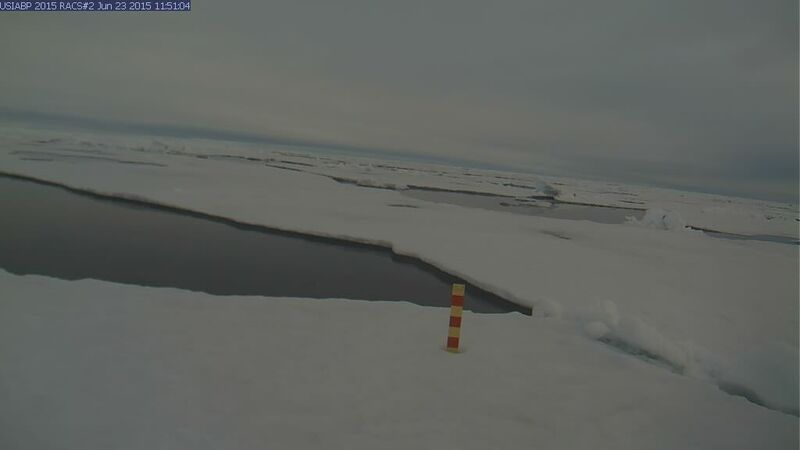 The North Pole Camera, (who I have named “Faboo”,) is showing its first sign of a melt-water pool, to the right in the mid distance. 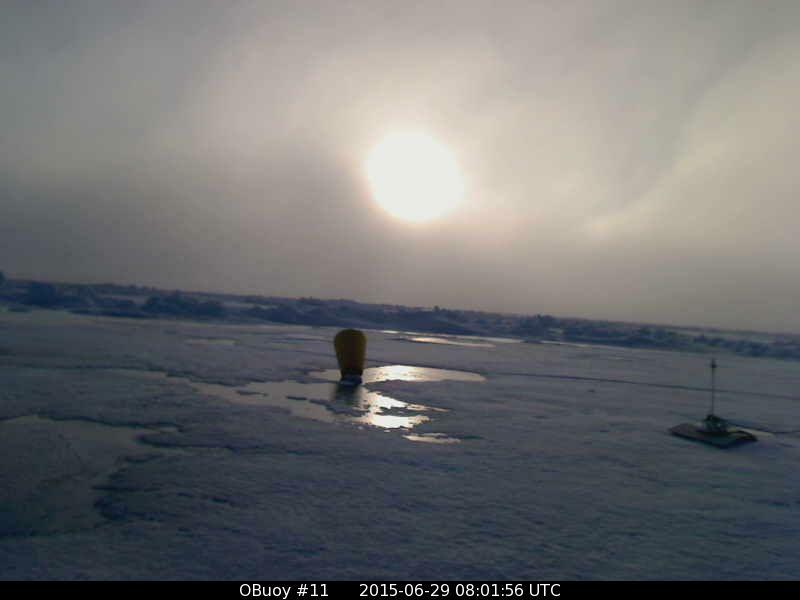 O-buoy 11 has made its own melt-water pool to sit in, by catching and reflecting the sun as the sun travels around and around and never sets, and other melt-water pools are also forming. ( A lead of open water hides behind the pressure ridge in the mid distance.) The most impressive melt-water pools were seen by Mass Balance Buoy 2015A, but it has gone on the fritz, so now we have to turn to O-buoy 12 to see an impressive pool, to the left. The edge of the pools are sometimes lighter because they are shallower, and sometimes because blowing snow has slush floating there. The centers of such pools are sometimes darker because they are deeper, and sometimes because particles of windblown dust and soot collect in such low places, in which case they catch sunlight and make the low places lower, in which case the water-filled dent may become a hole to right through to the sea, in which case the water drains down and the ice rises up slightly, which is something I like to witness. All things considered, the melting atop the ice is only a significant factor close to the land and the hot summer tundra, where much higher temperatures can blow out over the ice. Away from land most of the melting comes from beneath, or because the ice is transported south into warmer waters. 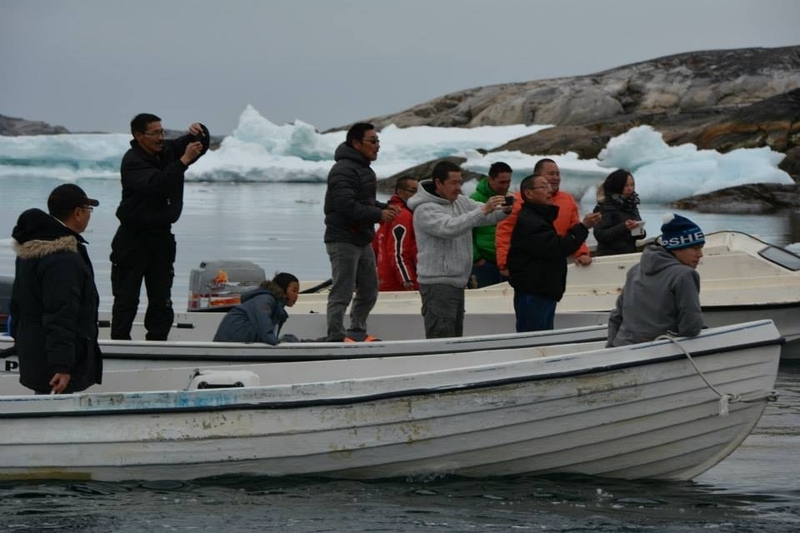 Such a transport may well be the fate of our oldest camera, at O-Buoy 9, which is currently grinding eastward along the north coast of Greenland. A glance at it’s view speaks a thousand words. Sunlight may be wilting the snow a little, but the real factor we are witnessing is transport. Anyone care to guess what that black object left of center might be? One interesting factor we have seen so far is the failure of Faboo to be transported south. 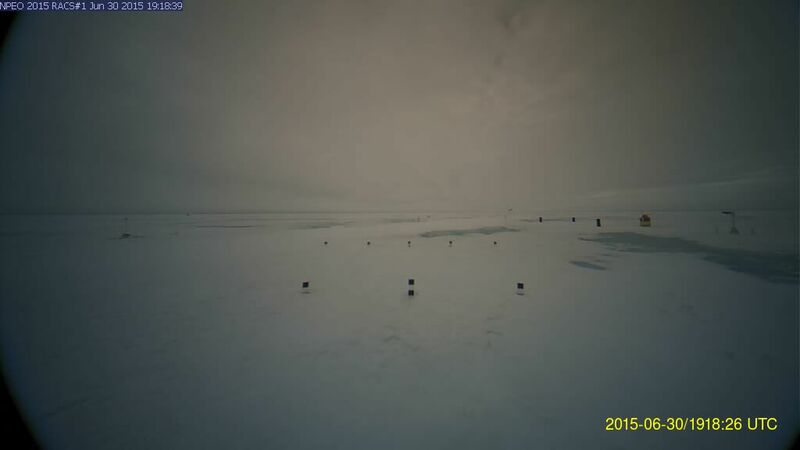 I’ll continue to report on the progress of Faboo, as well as the progress of the thaw, with updates. Judging from the time stamp, shadows, and the location of the sun, we are looking a little east of north. You can’t really go by compass up there, as the Magnetic Pole is near and moves, in relation to where you are. Also the berg you sit on tends to spin, so what was north yesterday may today be west. It pays to learn to tell direction by the shadows, what time it is, and your latitude. Otherwise you can make some embarrassing mistakes, which I won’t bother tell you about. 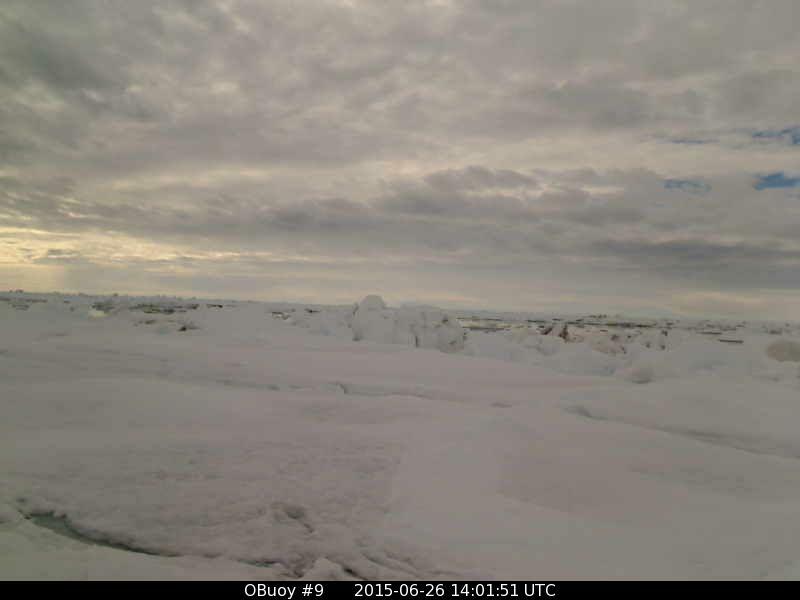 The Mass Balance Buoy Site still isn’t reporting. I miss it, but maybe the guy needs a week’s vacation. It is summer, after all, and students think you get time off. It is quite a shock to get out of college, and find out you work most of the summer. 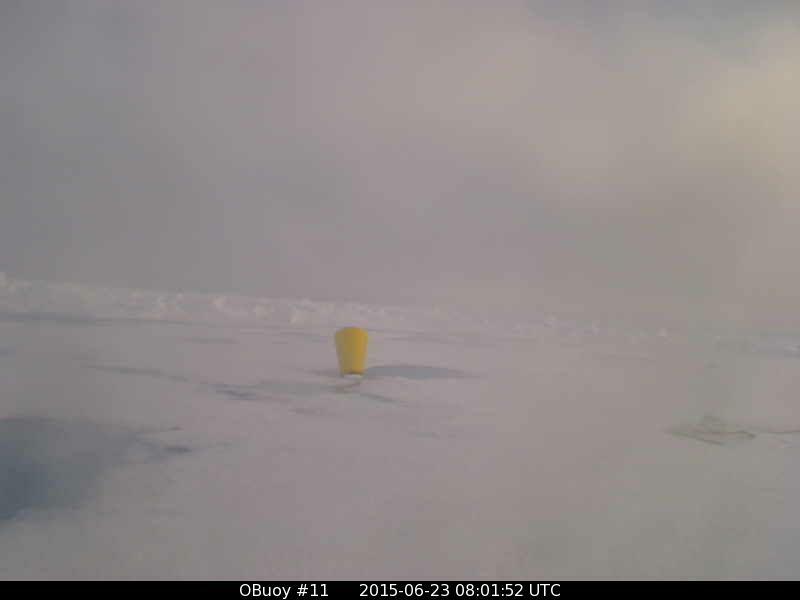 O-buoy 9 is coming out of a sharp freeze into a bit of a thaw, with lovely blue skies and sunshine. The lead appears to be widening again, in light winds. It is grayer over in The Beaufort Sea, where O-buoy 11 has seen temperatures either side of freezing. 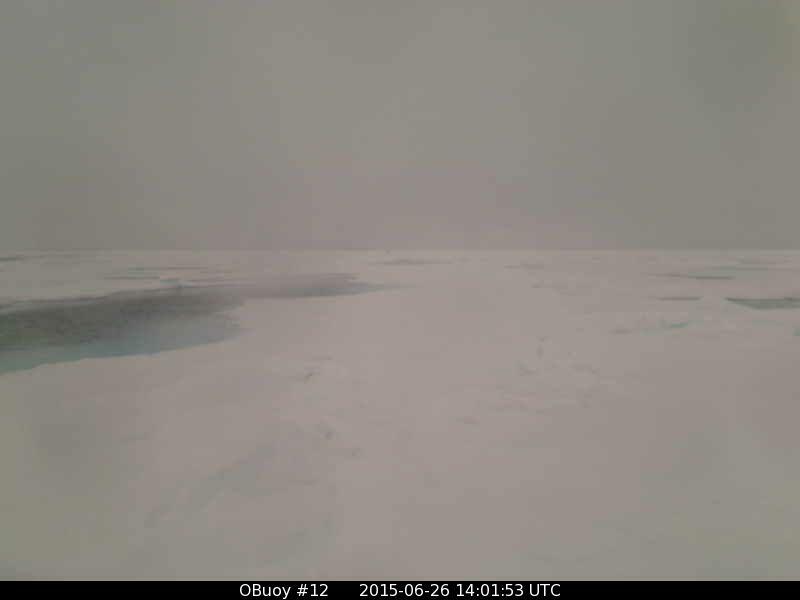 And over towards the Chukchi Sea O-buoy 12 reports temperatures just below freezing and gray conditions. 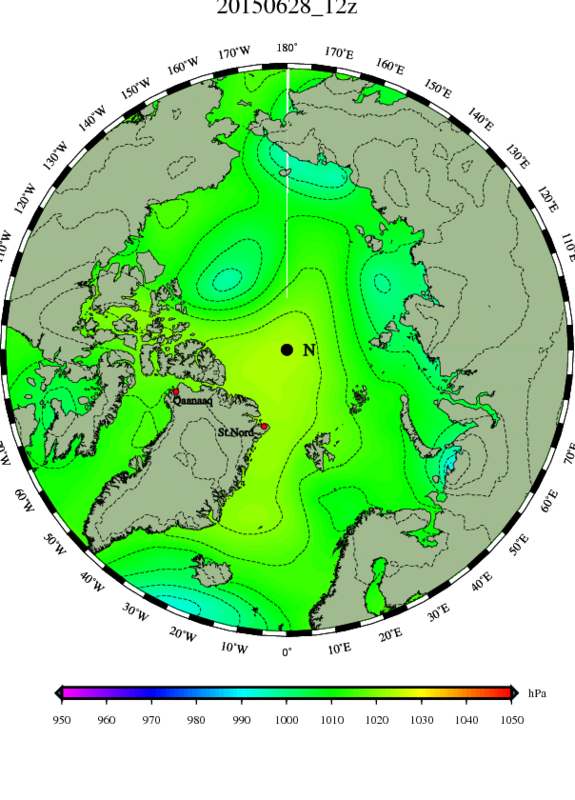 “Follower” has nudged the high pressure towards Fram Strait, and the other Lows orbit it. 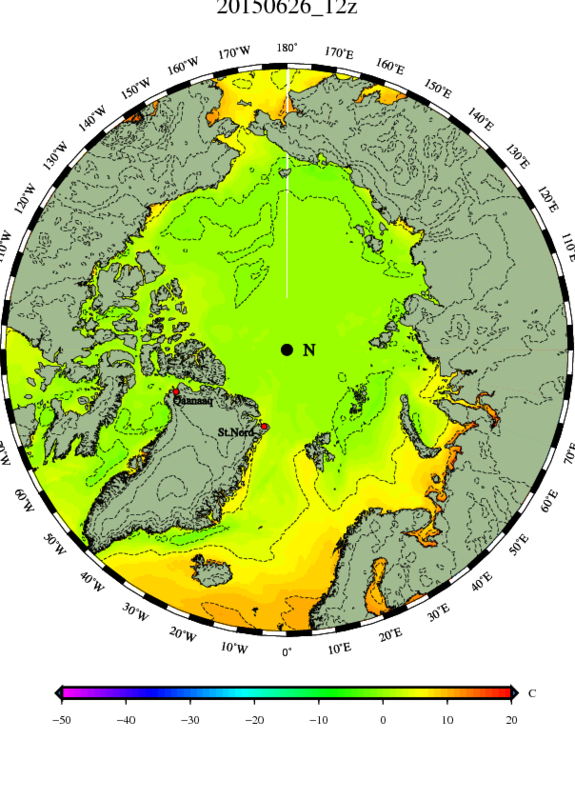 Old “Klyuchi” is down in Hudson Bay, “Laggard” just spins its wheels and goes nowhere south of Iceland, “Baltson” enters the Kara Sea, “Balt” and “FolFol” are a weak merger over the Laptev Sea, and “Folfolzip” is crossing Bering Strait. All are weak. Call it a merry-go-round. I suppose the closest thing to front page news would be Follower heading for the Pole. This time of year the North Pole has to import cold air from the south, and it looks like Follower might be doing that. Follower has knocked the high pressure down to Fram Strait where it seems to be weakening, and therefore Follower, despite weakening himself, is creating a weakness over the Pole which may allow an attacker up from Siberia. In central Siberia Balt and Folfol have arranged a merger and formed a hybrid I guess I’ll call “Baltfol”, and some models show it wobbling up towards the Pole in a few days. The other lows remain weak and unambitious. Folfolzip stalls over Bering Strait, Klyuchi sits over Hudson Bay, Laggard lags south of Iceland, and Baltson nudges east through Kara Sea, perhaps wanting to join the conglomeration hybrid of Baltfol (To be pronounced much like “Bashful”). Baltfol likely will involve all sorts of parts and pieces which I doubt I’ll have time to do justice to, so instead I’m going generalize in a most shameful manner. I’m pretty sure there is some climate-scientist jargon for doing that. Oh yes, I remember, “Homogenization.” What I call “Baltfol” is the homogenization of something that actually intricate and fascinating, and well worth the study of Siberian students of meteorology. The cold temperatures hitting Faboo don’t show up much in the DMI temperature map. Let me check the Canadian JEM model, which tends to highlight, if not exaggerate, cold. Yikes! I’m totally distracted by sub-freezing temperatures down over Hudson Bay, which is getting too darn close to my tomato plants. 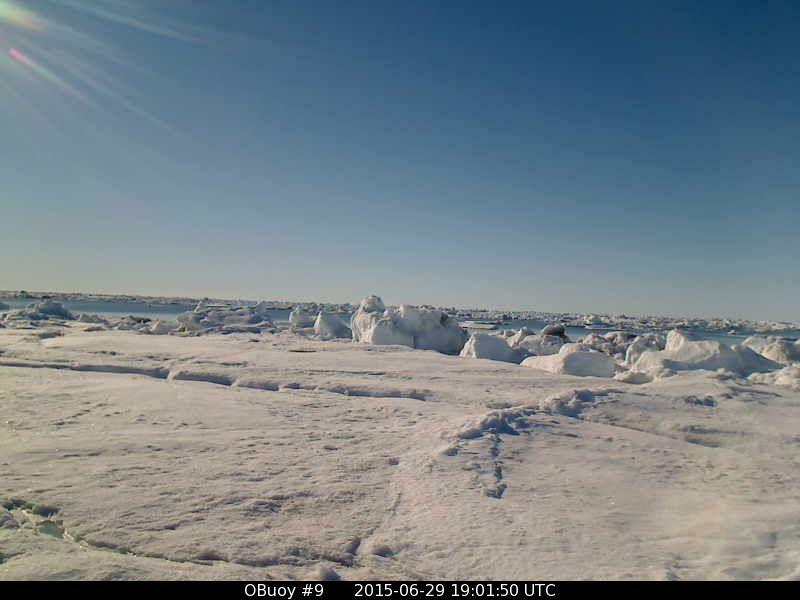 But what do tomato plants have to do with arctic sea ice? 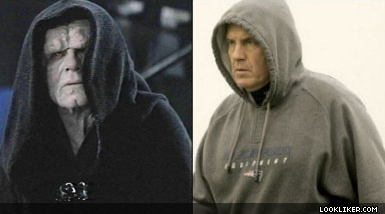 I’m off topic….or am I? 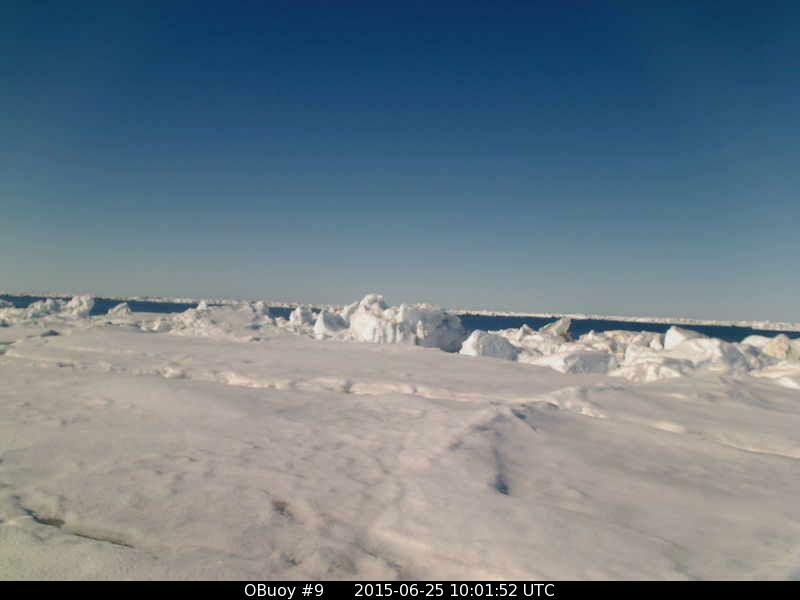 If sea-ice in Hudson Bay effects New Hampshire, I’m not off topic. But let me get back to other topics. The cold in Fram Strait is verified by Buoy 2015E: which is reporting -1.44° C, even way down at 79° latitude. The cold air in central Siberia clashing with warmer air looks capable of supplying Baltfol with some power. And that’s the news for now. The official update is in. Faboo drifted southwest and then southeast 2.39 miles to 87.018°N, 3.572°W. 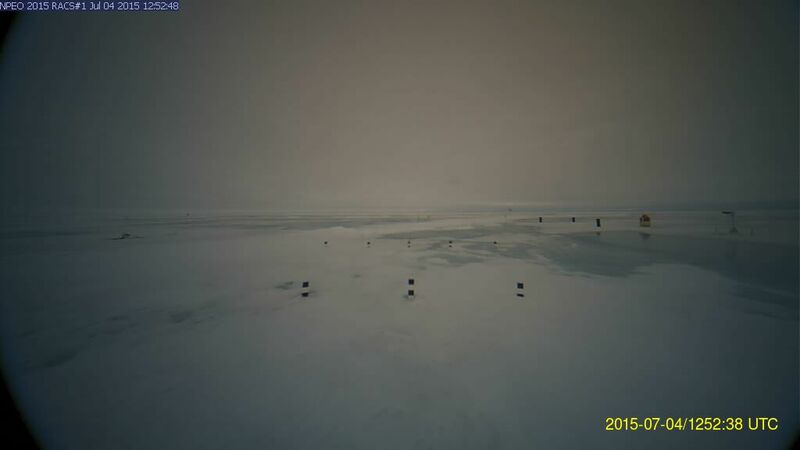 (The most westward position was at 0300z yesterday at 3.828°W.) However the real news was the plunge in temperatures. 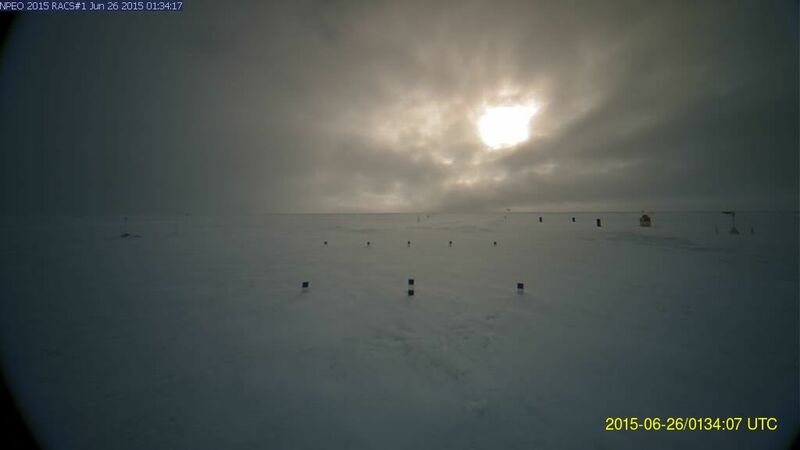 At 1500z on Sunday we touched our warmest temperature of the summer at +2.0°C, yet 12 hours later were down to -0.8°C, and 12 hours after that were down to -1.7°C, and the final data from 2100z last night has us at -2.4°C. This kind of sharp drop, when the pattern looks fairly benign and bland, always causes me to sit back and just scratch my head. This is especially true when the DMI map shows no below freezing air near the Pole or Faboo. However this morning’s map, which is closer to the final official 2100Z report, did show a little island of sub-freezing air by Faboo. (See morning update above). So perhaps this was just a small bubble of cold. So I look at the two latest pictures from Faboo. It looks to me as if the melt-water pools are lighter and smaller, as if they might be freezing rather than thawing. (This is a good time to open the pictures to new tabs, and then click to and fro between the two pictures, and decide for yourself). 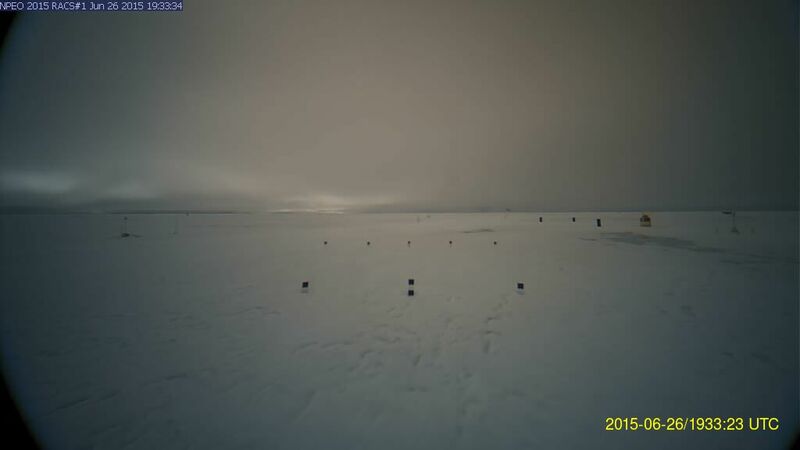 So next I cheat, and go to the unofficial reports (lacking a time stamp) from the co-located Mass Balance Buoy, and discover temperatures have only warmed to -0.82° C. Of course, without time stamps there is always the chance they warmed above freezing and then fell back down again. I’ll have to be patient and wait until tomorrow’s official figures, though I am not known for my patience. My hunch is that Faboo is experiencing no small pool of sub-freezing air, but rather a great lake. We have seen small pools of cooler and milder air recently, and I have joked how the temperatures bounce from below freezing to above (alarmists cheer) and dip back below (alarmist become dead silent) two or even three times a day. However this time the fall was slow and continuous, lasting at least 18 hours (as of the last official report), and likely longer. I should mention winds gradually rose from nearly calm to around 10 mph, so this isn’t a small pool developing due to radiational cooling in a calm isolation. Lastly, it was not a mere degree of drop, but 4.6°. It seems likely a significant area of cold has been created, yet is unseen by the DMI map. Why?. The answer is likely that there are few data points. In the old days a meteorologist would draw the isobars and isotherms between isolated weather stations, but now computer models draw the lines for us. However, just as a meteorologist in the old days might draw an isotherm incorrectly, because he had no idea cold air was being created, computer models can only draw as they have been told to draw by some programmer, and that programmer might also not know cold air was being created. In fact, we might be the only ones who know about this event. How about them apples!!? 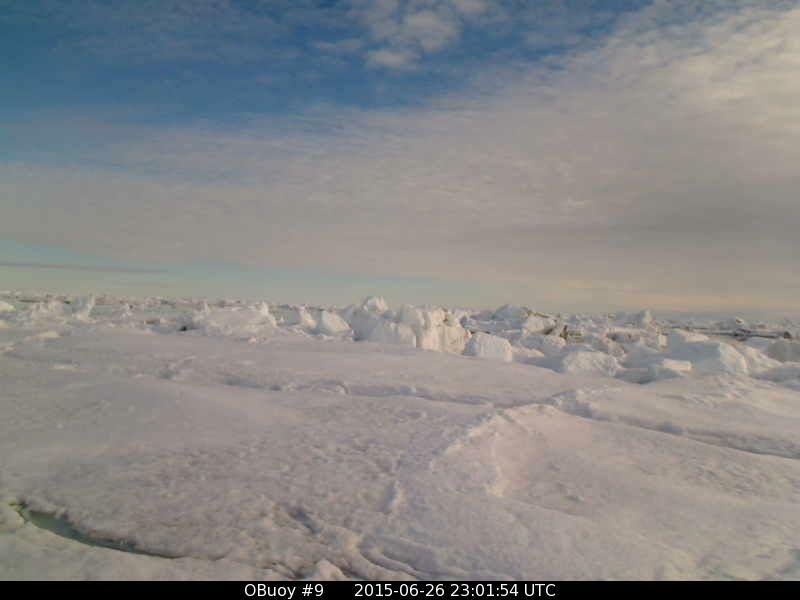 There are no other pictures, as the O-buoy cameras are still not reporting. 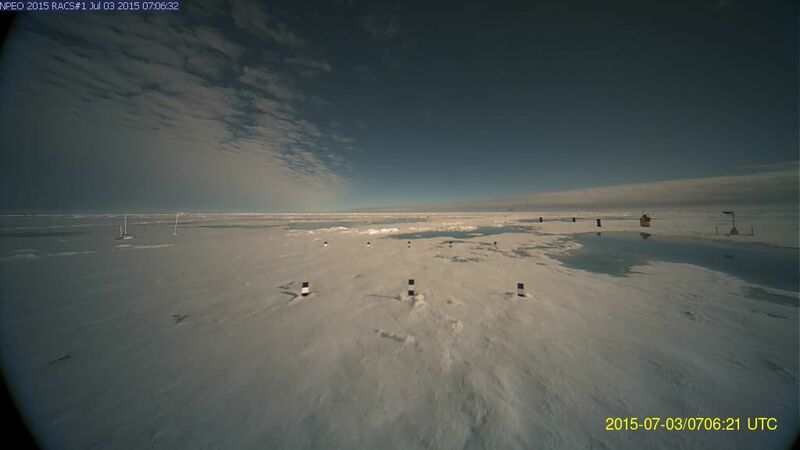 Over towards the Pacific side I assume night has fallen in the Mass Balance reports, for on the coast of Alaska Buoy 2015A: has cooled to +2.82° C, and the only other buoy above freezing is Buoy 2014I: at +0.24 C. In the Beaufort Sea Buoy 2013F reports -1.15° C, and Buoy 2014F reports -1.60° C, while further west towards the Chukchi Sea Buoy 2015B: reports -0.93° C and just north of it Buoy 2014G: reports -1.60° C.
And that’s the news for now, though I should add I’m fonder than ever of Faboo. With every other camera on the blink, Faboo keeps reporting. However the July 4th weekend is coming up, and even the slaves and servants of Faboo need a day at the beach after so much time looking at ice, so it would not surprise me if they missed a shift or two this next week. 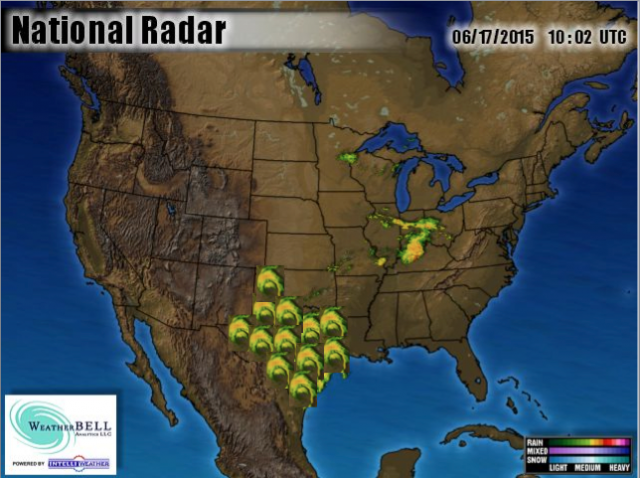 Oh, I forgot the weather map. “Follower” may have won the throne on the very top of the Planet, but it looks like it has cost him his life. He will now supply a path for whatever the hybrid Baltfol mutates into. Baltfol will likely absorb the faint recollection of “Folfol” hiding on the New Siberian Islands, as well as Baltson, just entering the Laptev Sea, and what appears to be Baltthree south of the Laptev. Laggard continues to lag south of Iceland, blocked by high pressure to the north that Follower knocked off the Pole. Klyuchi stagnates just north of Hudson Bay. The main center of activity is central Siberia, where “Baltfol” continues to get his act together. 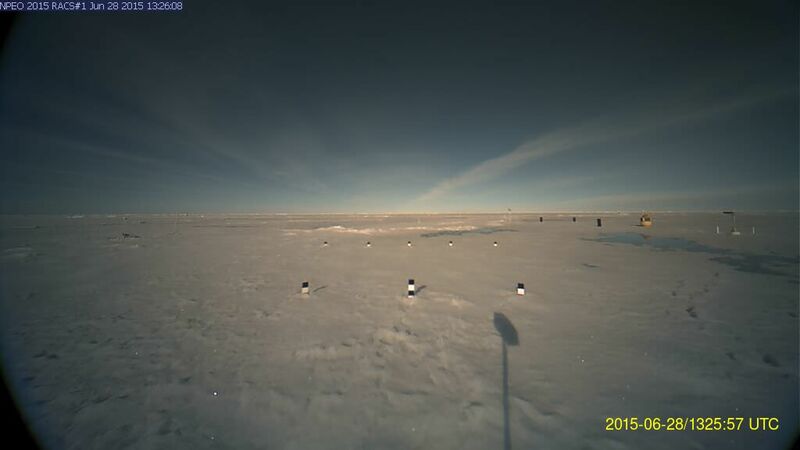 Things look calm over Faboo, and the unofficial Mass Balance report states the cold spell is over and thawing has resumed, with temperatures at + 0.14° C. While Faboo has drifted south of 87° again, unofficially to 86.99° N, 2.92° W, down in Fram Strait Buoy 2015E: has made it back north to 79° at 79.00° N, 2.36° W, and is reporting out coldest temperatures at -1.46° C.
Even though thse coldest temperatures are south of 80° latitude and therefore not included in the DMI graph, the graph shows even when thawing the Pole is a degree below normal. The view from Faboo continues gray and bleak. The only things consistant about Faboo have been they gray skies, and the motion slowly but steadily south and east, to 86.997°N, 3.002°W, which is 2.51 miles in 24 hours. Temperatures slowly rose, finally breaking freezing around 1400z and cresting at 1800z at +0.7°C, before starting to fall again. The thaw should be helped along by a bit of drizzle. I’ll go over maps in the morning. In the above map it is midnight in Fram Strait and noon in Bering Strait. 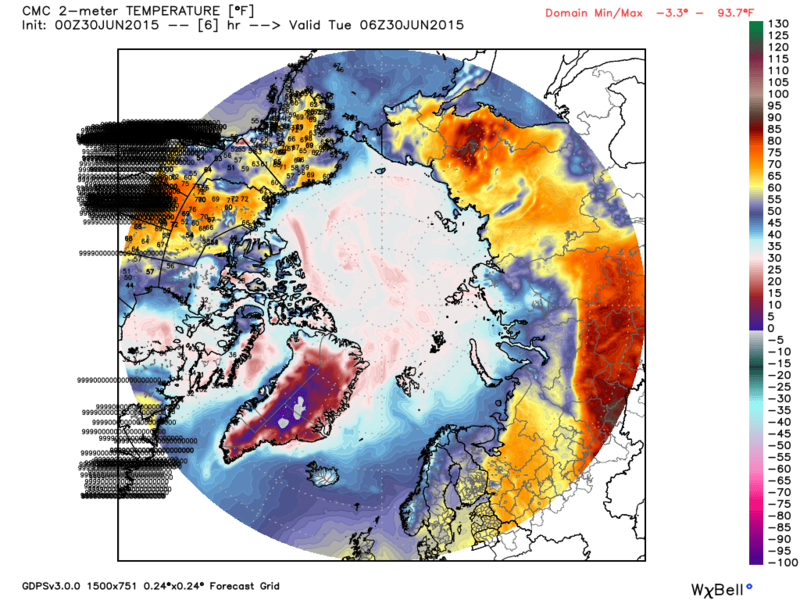 Slight diurnal variation seen, with cooler temperatures around Svalbard, and warmer in Chukchi Sea. 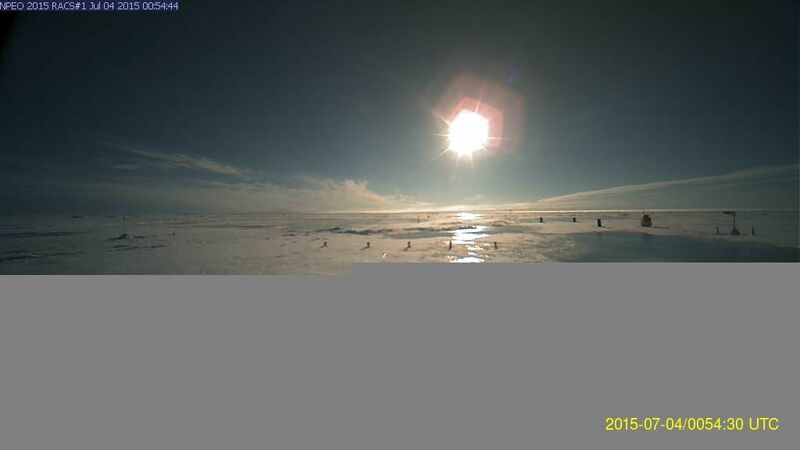 Pool of sub-freezing air over East Siberian Sea even as the sun gets high. “Baltfol” is the biggest storm, in Laptev Sea, with pressure at 990mb and breeze at 20 knots. The only othe breeze is a west wind along the coast of Alaska, up to 20 knots, created by the contrast between warm land and cool sea. The weak 1003mb storm “Folfolzip”, now moving east northeast of Bering Strait, is the only other low wirth noting. For the most past summer calm has decended. 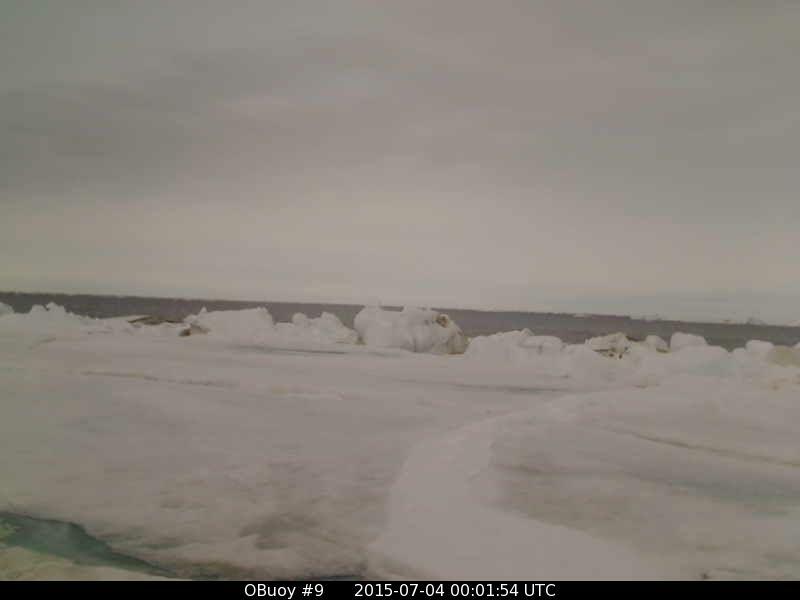 The O-buoy site is up and running, and all cameras show gray skies and conditions near freezing. 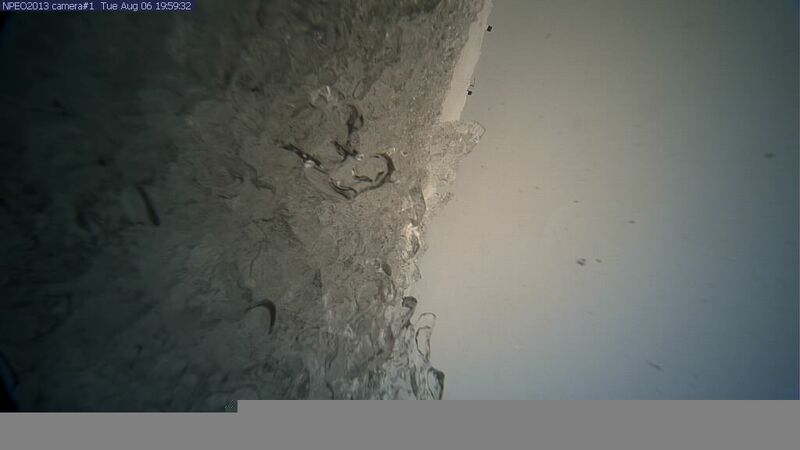 O-buoy 9 shows the lead in front of it has closed up, and there is melt-water in the crack to the lowest left. The buoy has drifted back west and south a little, which I didn’t expect. 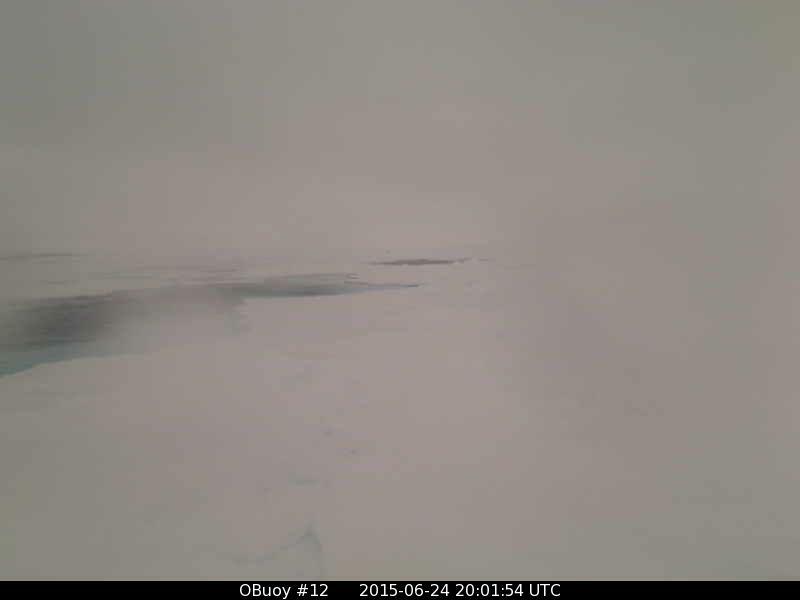 O-buoy 11 shows slushy conditions. Co-located Buoy 2014I: reports a very mild + 2.12° C, which is a heat wave for the Beaufort Sea. 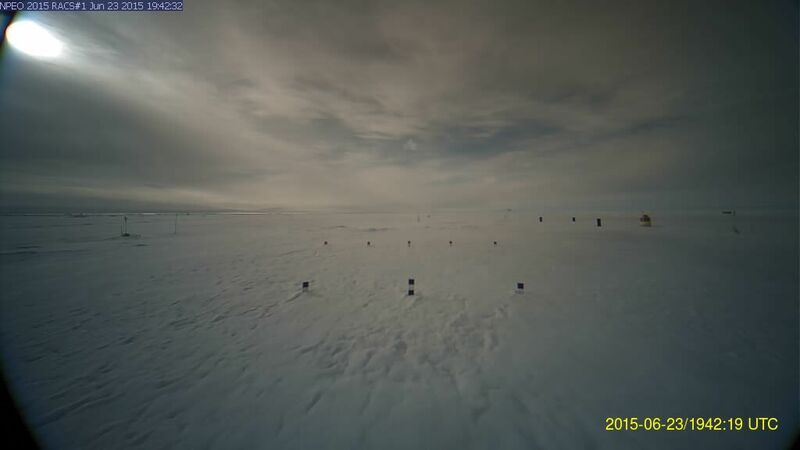 Further west at O-buoy 12 the co-located Mass Balance thermometer is reporting +0.23° C, but its own thermometer may be more recent and seems to show temperatures have dipped below freezing. 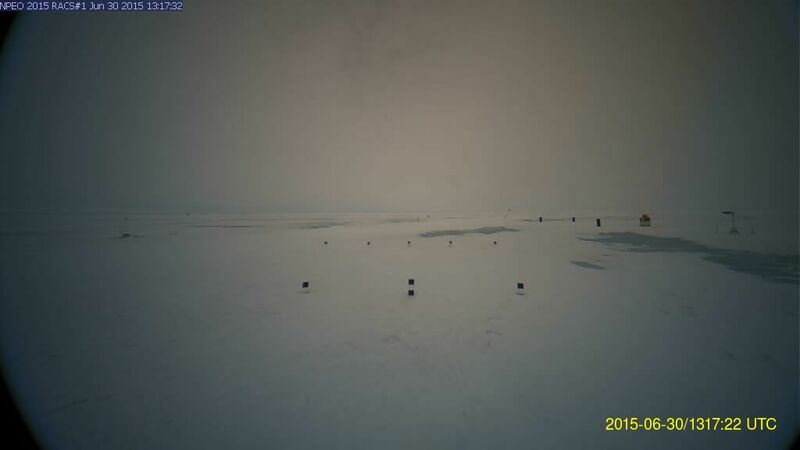 44.1 miles south of there Buoy 2015B: is reporting -0.01 C, and if you go 466.4 miles south-southeast to Buoy 2015A: l right on the coast of Alaska, temperatures are a toasty +5.07° C.
We should be able to sit back and watch the melt-water pools expand for another 45 days. Temperatures up in the arctic seem to have nudged back to normal. What is more unusual are summer snows and freezes, as we had last year. Also I’m on the watch for continued grayness and gloominess, which I tend to blame on cosmic rays, as Svenmark suggested a Quiet Sun might allow more cosmic rays to strike Earth, making more clouds. In fact, whenever it is gray around here, in New Hampshire, I am known for scratching my grizzled jaw, scowling up at the sky, and muttering, “Durn Cosmic Rays”. Of interest was the fact the official record shows no temperatures below freezing, while the Mass Balance buoy did. Officially we hovered between 0.6°C and 0.4°C, finishing at 2100z at 0.4°C. Winds were steady but light, around 8 mph. 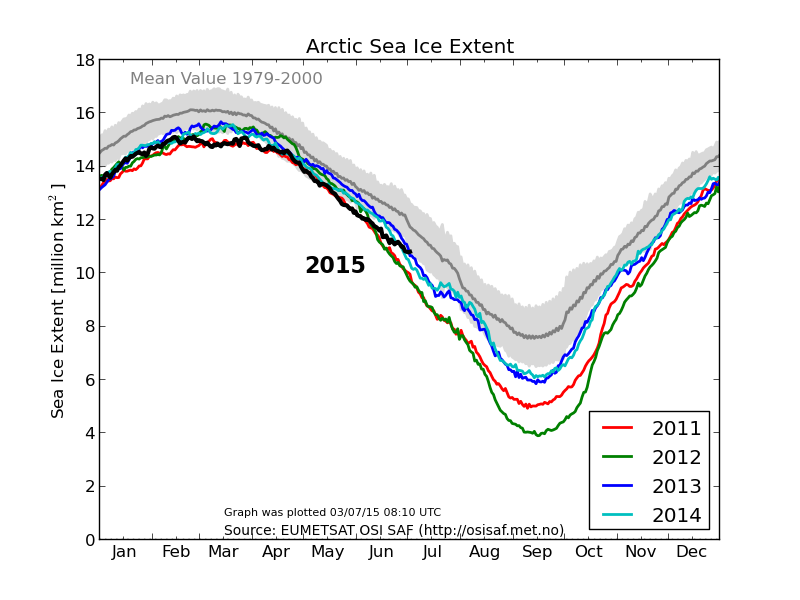 The big headline item is the expansion of the meltwater puddle to the center right. To preserve tradition, I’ve decided to call the puddle a lake. It will be “Lake Faboo”, and I expect it to gobble up the two puddles in the central distance soon. The light rain is very helpful, when it comes to thawing, as often the air aloft is milder and the falling drops are relatively warm. Currently the thaw is more active on the Atlantic side than the Pacific side, which has not been the rule and is not what I expect. 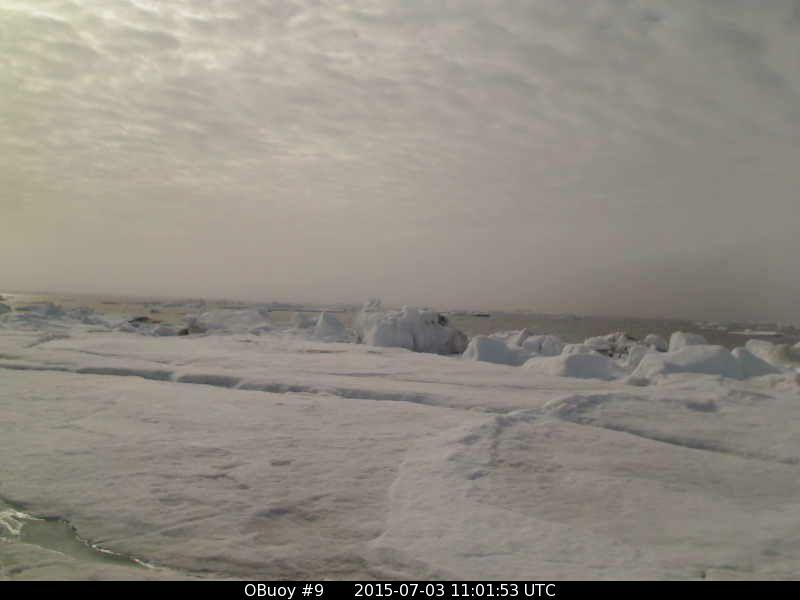 It is mild and thawing, and sunny for a change, down at O-buoy 9. 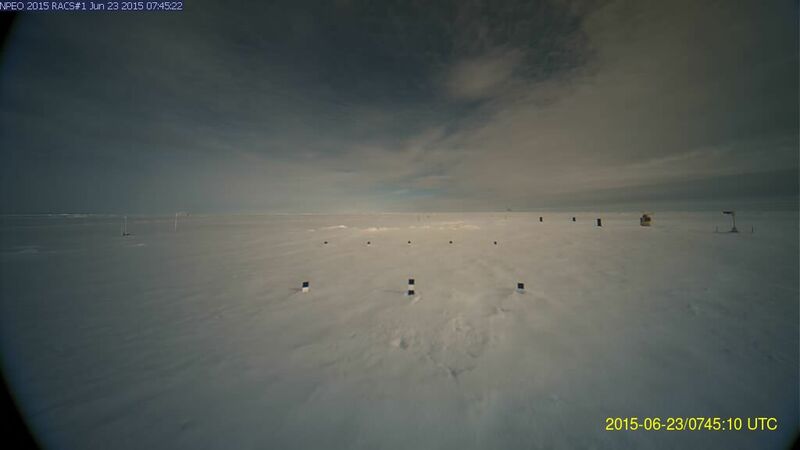 Faboo continues its slow drift southeast, with the unofficial thermometer again showing a dip below freezing to -0.57° C. The gray skies persist, despite an attempt at brightening earlier. O-buoy 9 had a beautiful view of the lead reopening and widing, which I should have saved, but I put coffee first, and by the time I returned to the view (which updates every 15 minutes or so) the clouds had rolled back in. The lead has likely reopened because our westward movement ceased, and we are progressing east again. Temperatures have returned to just above freezing, after yesterday’s brief spikes. 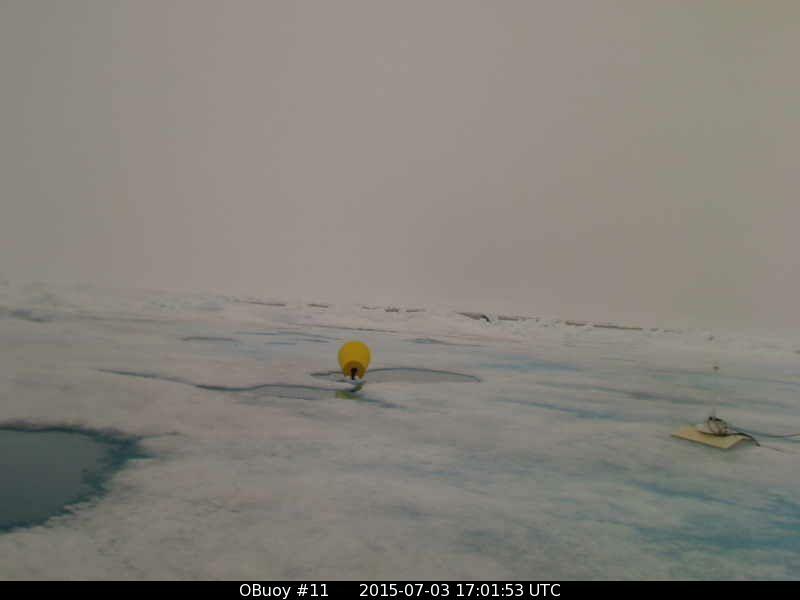 Over in the Beaufort Sea O-buoy 11 is reporting a thaw at +1.67° C, the gray skies have returned, and the yellow trash can fell over with a tremendous crash. 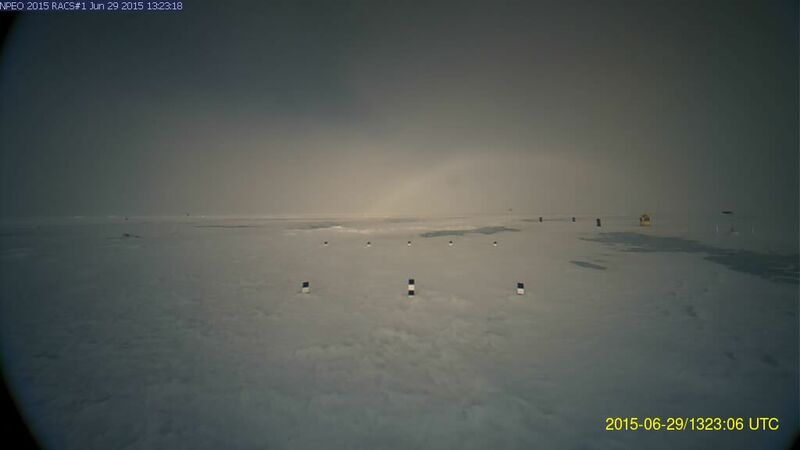 Meanwhile further west towards the Chuckchi Sea O-buoy 12 os reporting a slighter thaw at + 0.23 C with the Mass Balance buoy, which may be outdated, as the buoy itself looks like its back below freezing. Here too the gray weather persists. The mildest temperatures are over on the coast of Alaska, where Buoy 2015A: is peaking at +7.01° C. This one bears watching, as some cold air may be headed their way. I’ll talk about the maps later, but all these pictures of gray weather have me craving blue skies, so I’m stepping outside, as the cosmic rays aren’t bad ’round here, today. Aster all my grousing about gray weather this morning I suppose I’m now being shamed into admitting it always isn’t gray in Faboo’s neighborhood. The clouds rolled away, likely moments after I made my pronouncement. (That seems to be a hazard weather forecasters of all sorts face.) The amazing thing is the immediate effect the sunshine had on the sea level. 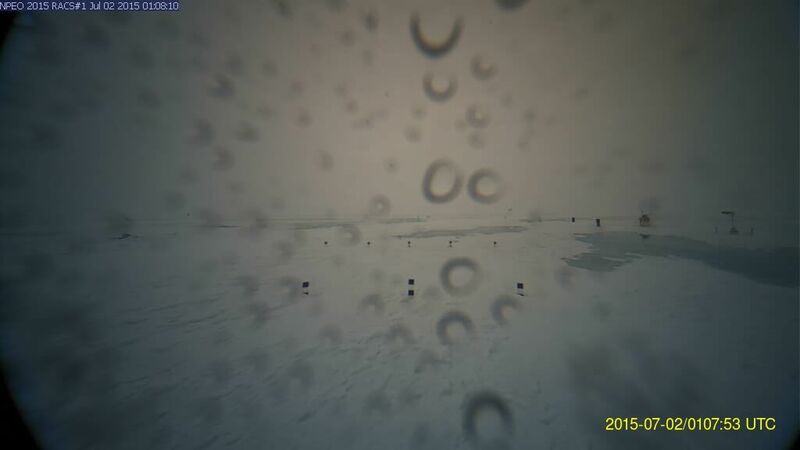 Unprecedented melting brought the grey slush more than half way up the lens of the camera. For the life of me I don’t see why the media isn’t reporting this! I think I have a scoop here! In regard to more mundane matters, Faboo continued its slow southerly drift to 86.880°N, 2.577°W, which is another 3.45 miles towards Fram Strait. Our eastward movement stopped at 2.526°W at 0300z, and since then we’ve been nudging back west. At 0300z we also touched our high temperature of +0.7°, and then readings slowly fell, remaining above freezing until our final report at 2100Z, which was -0.3°C. Winds remained light, at around 7 mph. 550 miles south of there in Fram Strait Buoy 2015E: has its warmest reading of the summer, at +2.95° C, and roughly 250 miles northwest of there O-buoy 9 continues east, with temperatures right at freezing and winds dropping to a near calm (after peaking at around 12 mph earlier). Conditions continue gray, and the wide lead makes me nervous about the safety of the camera. 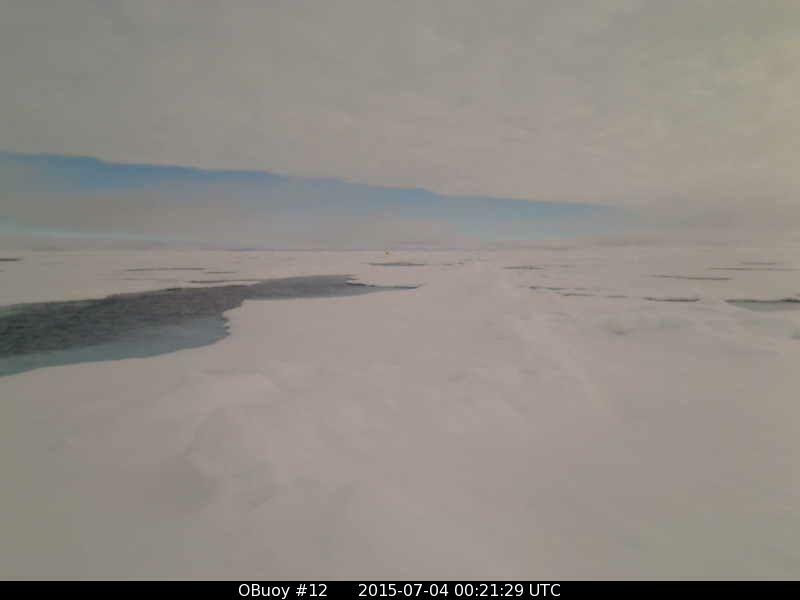 A mere 1300 miles further west (as the crow flies) on Beaufort Sea, O-buoy 11 is seeing some blue, but for some reason it is the ice and not the visible sky. Perhaps the sky above is blue, but in that case I would expect the puddles to be blue as well. There is only one other possible solution: The water beneath the ice has become Caribbean! Oh, wait. The lead peeking over the ice along the horizon is not so blue: In fact it is the battleship gray of the North Sea in winter. Hmm. Maybe that ice just turned blue because it is feeling sorry for me, after all my grousing about gray skies. 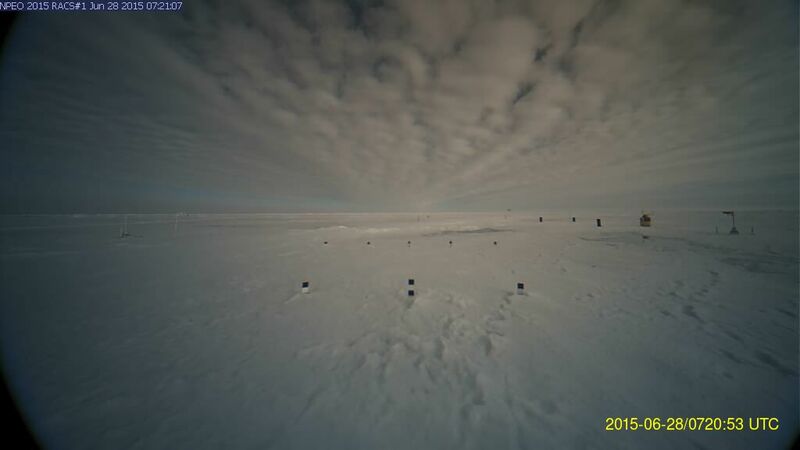 Temperatures are just above freezing, with co-located Buoy 2014I: reporting +0.46° C.
Things are colder 400 miles further west, where Buoy 2015B: is reporting -1.44° C. Around 40 miles north of it Buoy 2014G: reports -1.19° C, and co-located O-buoy 12 gives a hint of …..blue! Ah! Blue at last! 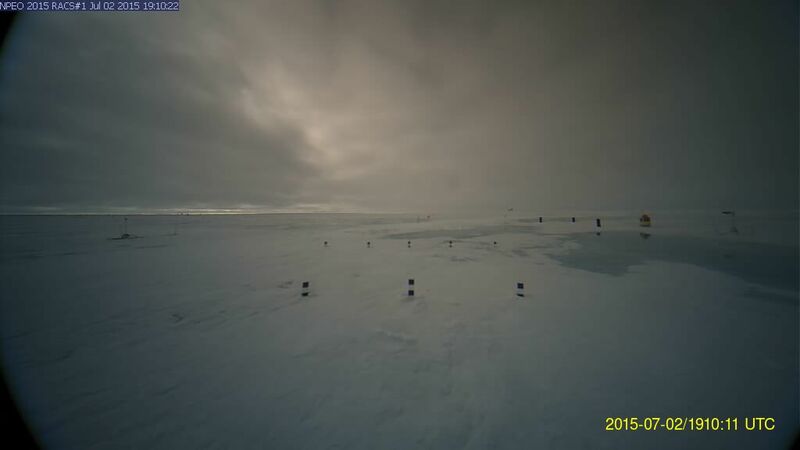 Winds have been breezy, around 16 mph, and earlier the melt-water puddle to the left, (which we will henceforth call “Lake Chukchi,”) had definite ripples on it. Now there are no ripples. Has the wind died, or has Lake Chukchi frozen? Now here’s a bit of trivia for you. Is lake Chukchi fresh water? The standard answer is “Yes”, because it is known that when the saltwater freezes the salt is exuded, or rejected, (or whatever the proper word is.) Often it concentrates as super-cooled brine that bores down through the ice, and which can even form a sort of icicle as it touches the less salty sea-water beneath. In fact there are cool pictures from Antarctica of these brine icicles reaching the bottom and freezing passing starfish in their tracks. Then, because the brine removes the salt, it is assumed the ice above is fresh or nearly fresh, so the melt-water pools must be fresh. (Buzzer) Wrong! Why? Well, the salt is not always exuded downwards as brine. Sometimes, especially in cases of flash freezing, it is rejected upwards, and can form rather pretty “flowers” of salt crystals on top of the ice. These delicate formations are broken by even modest winds, and then become dust in the wind which, because temperatures are extremely cold, don’t have the power to melt ice that salt ordinarily has. I’ve seen such salt dust blowing across sea-ice with my own eyes, as far south as the coast of Maine, and therefore expect the amounts of salt blowing around with the snow can .become considerable, especially during winters when many leads open and are flash frozen. However, as soon as temperatures rise past a certain point in the spring, the salt loses its ability to be dust in the wind, and starts melting the snow. Therefore, I conclude, if the circumstances are right, the first melt-water pools that form are not fresh water, and may actually be especially salty at first. This may explain the ability some pools have, at first, to stay unfrozen even when temperatures are below freezing, and also their ability, (which seems a bit uncanny at times), to eat downwards through the ice. Of course eventually, as the salt works through, and as more and more freshwater ice melts, and even some rain falls, the melt-water pools become more fresh water, until explorers can drink it. However when I scrutinize Lake Chukchi, I wonder if it is still a bit salty. I still haven’t discussed this morning’s and afternoon’s maps, but I’m in the mood to procrastinate. I’ll just post them for you to scrutinize, as I become a lazy old dog and practice snoring. The maps show high pressure nosing back up to the Pole, as Baltfol spins its wheels in the Laptev Sea, oddly without breaking up the sea-ice much. Weak Folfolzip is tiptoeing about the Beaufort Sea, apparently generating some cold air in Being Strait that isn’t fluctuating in the normal diurnal manner, and is moving along to the coast of Alaska. Lastly Laggard lags south of Iceland, but apparently is kicking a zipper storm ahead into Europe, to end the heat wave in Paris and perhaps give the dry south some rain, but apparently not managing to get some heat up to Finland, where the summer has been cool and wet. It is an interesting pattern, with basically three storms in the Northern Hemisphere, but we may be about to get a boot in the backside. The Pacific is going haywire down in El Nino land, with a major SOI crash just concluding, and a MJO spike right off the charts. The first effect of this will likely be to explode some super typhoons in the West Pacific, but I’m expecting a big stir down there will eventually stirs things up here. In the meantime Faboo is lollygagging south, with the unofficial temperatures down below freezing at -0.90° C, despite brilliant sunshine raising the sea levels halfway up the lens. 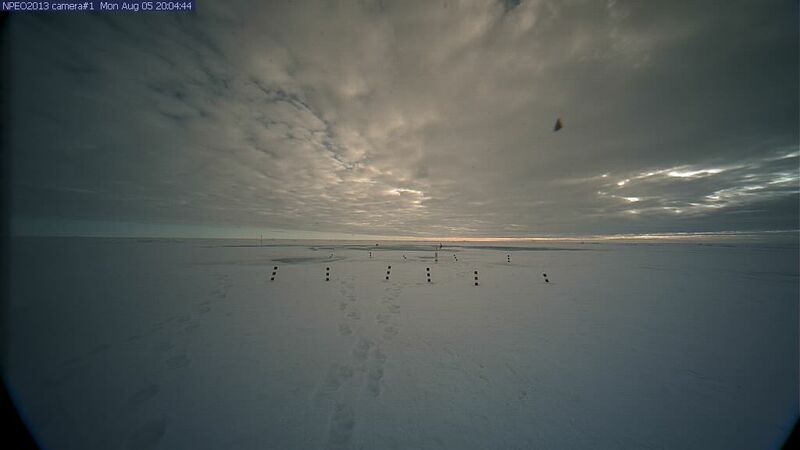 (With the sun dead ahead just past midnight, on the meridian, we are looking north towards the Pole.) Proof that the gray area at the bottom is due to the rising sea is supplied by the fact that as soon as the temperatures drop below freezing and the clouds return the sea sinks…. (either that, or maybe the solar panels can’t handle too much sun, and overcharge or something.) 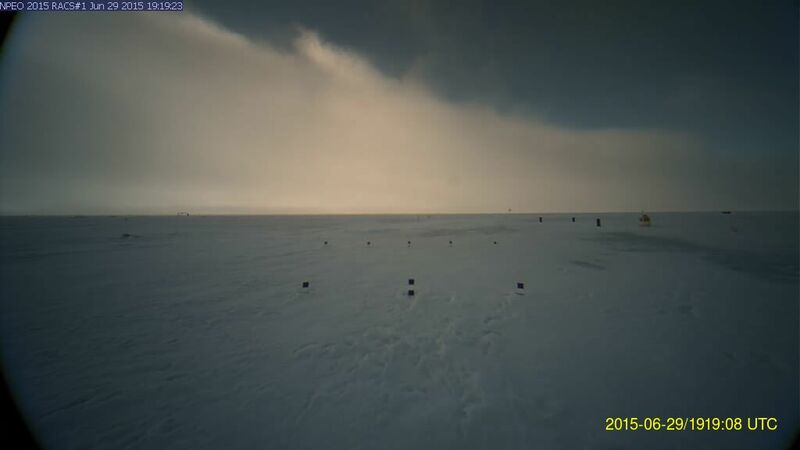 In any case, we are back to our typical drabness, Despite the sub-freezing temperatures Lake Faboo is expanding, flooding the central mid-distance, which makes sense when you consider the freeze is not even a full degree below freezing, and the sunshine was intense and non-stop. (Think of a sunny day in March, when the roads start to melt off long before temperatures get above freezing.) 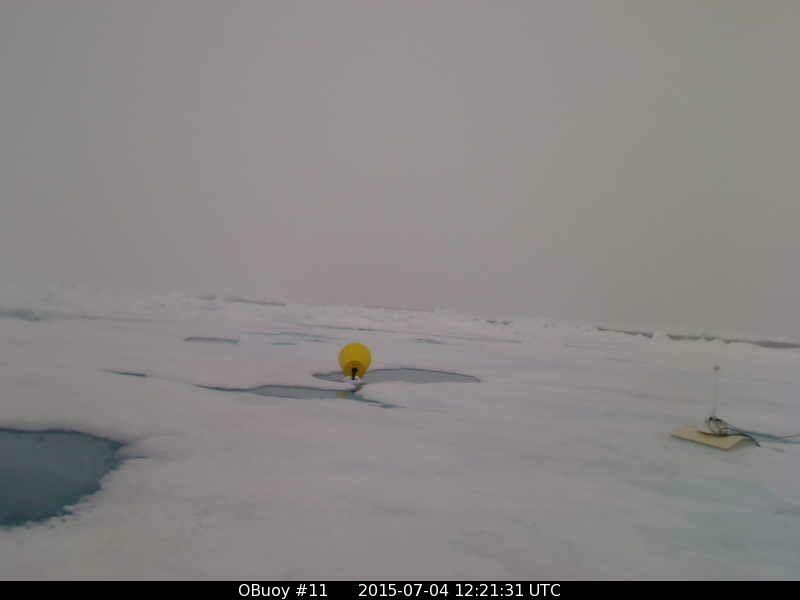 Down in Fram Strait the thaw is over, as Buoy 2015E: is back down to -0.15°, but just north of Greenland O-buoy 9 sees slight thawing continue, as the lead starts to close. Lets hope it closes gently (winds are still light) for too great a crunch might bury our camera in rubble. 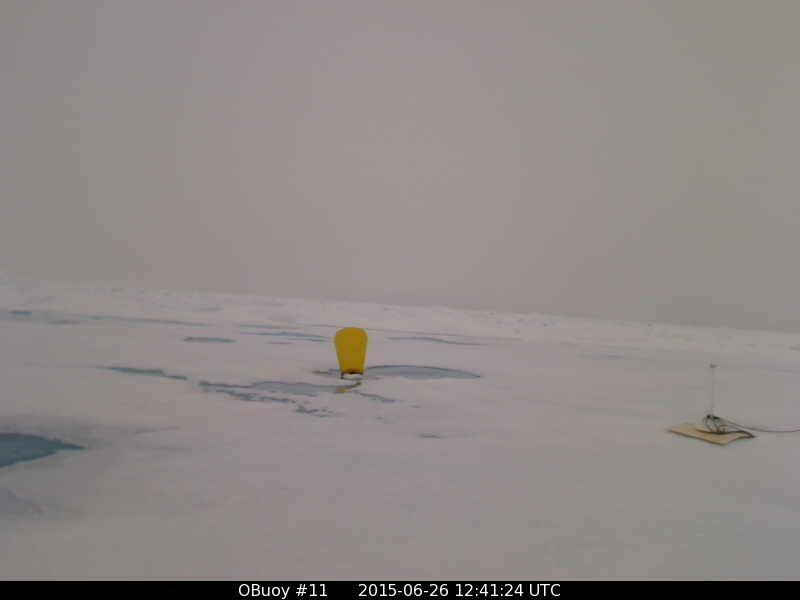 Over in the Beaufort Sea Buoy 2014I: and O-buoy 11 are reporting continuing thaw at +0.40° C, with the lead in its distance looking a little wider. 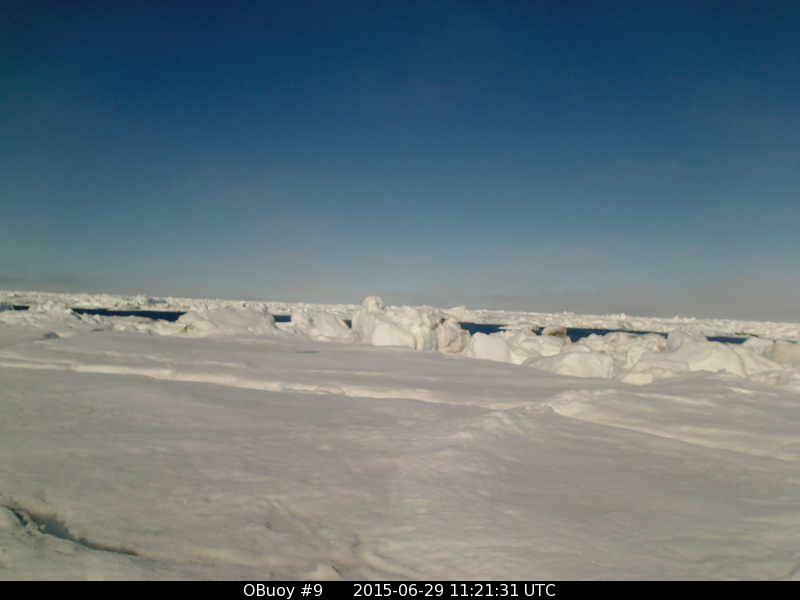 Further west towards the Chukchi Sea it is freezing, as Buoy 2015B: reports -0.13° C and Buoy 2014G: with O-buoy 12 report -0.36° C. The Mass Balance reports lack a time stamp, but I think these are from the “warm” part of the slight diurnal swing, which makes their sub-freezing status a little more significant. 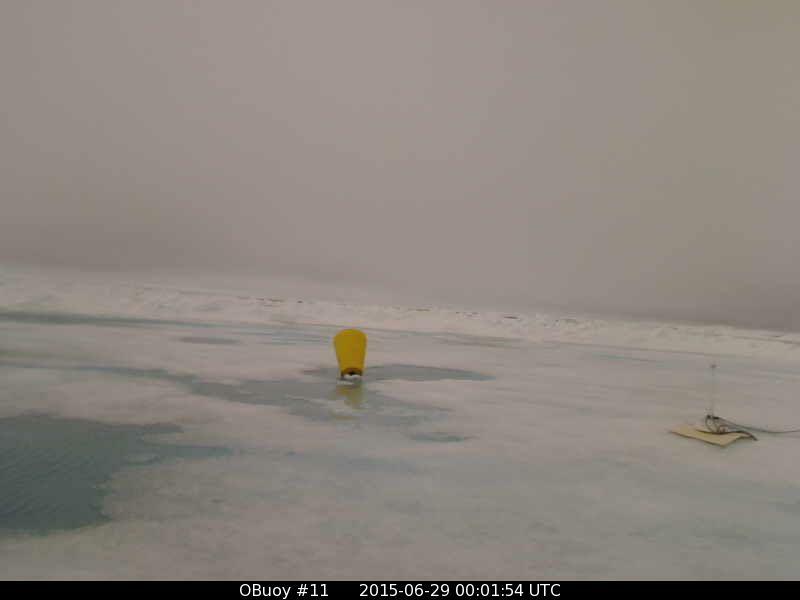 Down along the coast of Alaska Buoy 2015A: has dropped nearly 4° to +3.49°. The DMI temperatures are only a hair below normal north of 80° latitude, And for the most part the slush season seems to be progressing in a normal fashion to me, however the extent graph continues to show a reluctance to fall at the normal precipitous rate. It is still too early to state whether this means anything much, but both the Laptev Sea and Hudson Bay have more ice than last year. In fact I think I’ll conclude this post, and write a brief post about that item, attempting to make it sensational news. I have pretty much avoided the topic of polar bears, in my discussions about arctic sea ice, because right from the start I saw them as a sort of media icon, even a false god, and simply didn’t think they had much to do with the weather at the North Pole. And they don’t. 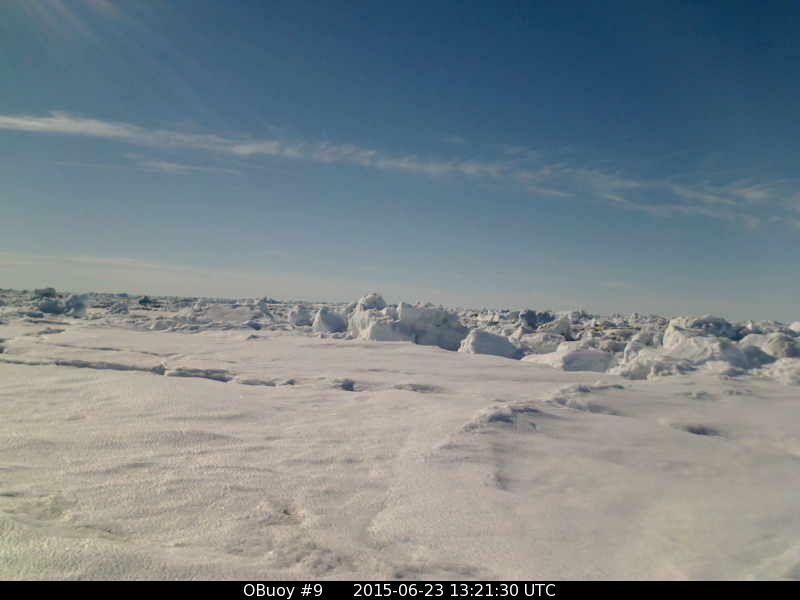 When I’ve mentioned polar bears it is primarily because they are opportunistic feeders, and when scientists place the cameras and buoys I like so much out on the sea-ice, such scientists run the risk of becoming a bear’s snack. So actually it is only to emphasize the guts of those scientists that I bring up the topic of bears. Bears do mess up my observations. Initially they just tracked up the snow, adding a new variable to the plethora of variables that influence the melt. I was even tempted to call their footprints “unnatural”, back on October 15, 2012. And if that wasn’t bad enough, sometimes they got in the way of my viewing the ice. And another time they not only left tracks, but some sort of booger on the camera lens, And from there it was a short step to just plain flattening the camera And therefore it should be obvious that, as much as I might like to avoid the entire subject of bears, they refuse to be ignored. Not that the media will let you ignore them. Bears seem part of their plan to get people behaving in a manner they think is politically correct, concerning the topic of Global Warming. Bears are sort of cute, when viewed from afar, and if you can touch a person’s heart by showing a cute bear stranded on a dwindling iceberg, and suggest the cute bears are facing extinction due to the callous use of fossil fuels, then you don’t have to bother prove the ice is actually dwindling. The sentimental suckers are sobbing, and having so much fun blubbering and blowing phlegm into Kleenex, that science comes second. Of course seals are also cute. Some might even argue they are cuter. And it just so happens that polar bears lurk by the holes in the sea-ice where seals surface to breathe, and brain them with a single swipe of a massive paw, and hook the unconscious seal up onto the ice with their huge claws, and then proceed to get their white fur red, gorging on the seal. But the media doesn’t show those pictures, because it fails to further the “cause”, which is dependent on bears being “cute”. People who live in the north are under no illusions about how bears get so fat in the spring, and how many seals they eat, and how bears also might eat a neighbor, if the opportunity arose. However Northerners are not in a hurry to tell tourists who come north to see bears that the bears aren’t so cute, or to scorn the media’s “cause”. 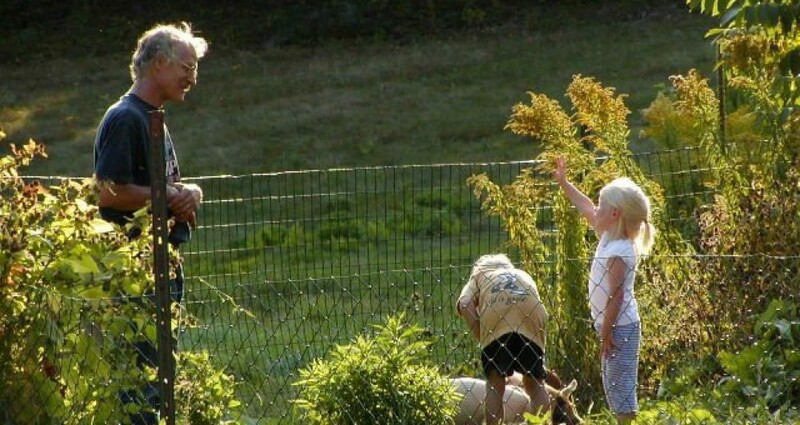 After all, “the customer is always correct”, and you don’t want to offend the tourists. You need to quell the urge to roll your eyes, and instead nod and look sympathetic, as tourists speak blathering nonsense. In like manner, scientists also don’t want to offend the customer, who is forking out the money that allows them to tramp about the arctic rather than working a Real Job at a Burger King. Some scientists have even taken it a step further, and do more than nod sympathetically. They produce ridiculous “studies” that further the “cause”. For example, most bears are complete gluttons, when it comes to chowing down on cute seals, and by the time the ice melts away and they come ashore they are downright pudgy. However that will not alarm the public. It is better to find some elderly bear, who has trouble hunting and who is often robbed by young, punk bears, when he does catch a seal. This bear is not scrawny due to Global Warming. He is old, and guess what? When we get old we die. It may not be cute, but it happens to every human, and also to bears. However if you are a scientist in need of funding, it may keep you alive a bit longer if you can make up some sort if link between old bears being skinny and fossil fuels. It will please the customer by supporting the “cause”. Of course, it helps if you can get a picture of an elderly, skinny bear by a porpoise carcass. 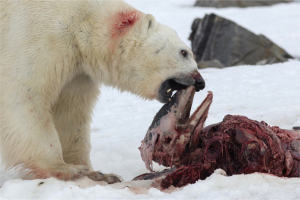 Perhaps it should be mentioned at this point (because the media won’t) that polar bears are at the top of the food chain, and therefore don’t die because of another animal, unless a man hunts them. So what do they die of? 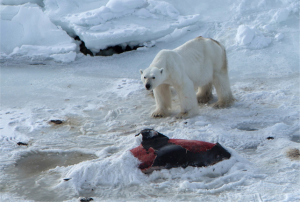 What is the death-by-natural-causes for a polar bear? It is starvation. 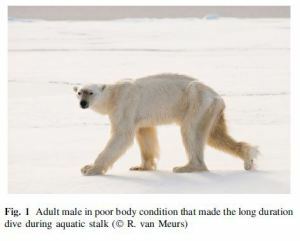 Not cute, but a fundamental fact every polar bear scientist knows. Also a good many people who live in the north know it as well. Therefore, when a scientist goes off the deep end and throws his integrity to the wind, producing a “study” that suggests old bears are starving due to Global Warming, all the other scientists know he has sold his soul. All the local people know he has sold his soul. And, even when they don’t want to offend the customer, or disrupt the gravy-train of funds for the “cause”, a sort of contempt leaks into the banter one hears, if one frequents arctic sites seeking information about sea-ice, as I do. Perhaps people do recognize the difference between fiction for a “cause”, and truth. Perhaps there is even hope for the human race. For I keep seeing signs that the fiction created for the “cause” has passed some sort of limit, and credulity has been stressed beyond its bounds, and people can’t help themselves. They have started to burst out laughing. 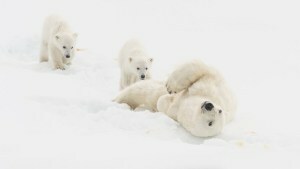 Another example involves mother bears, and where they chose to have their cubs, which are definitely cute. It turns out that a mother bear requires a solid foundation of sea-ice upon which to dig her den, within which she gives birth to her cubs and nurses them until they are big and strong enough to follow her about. 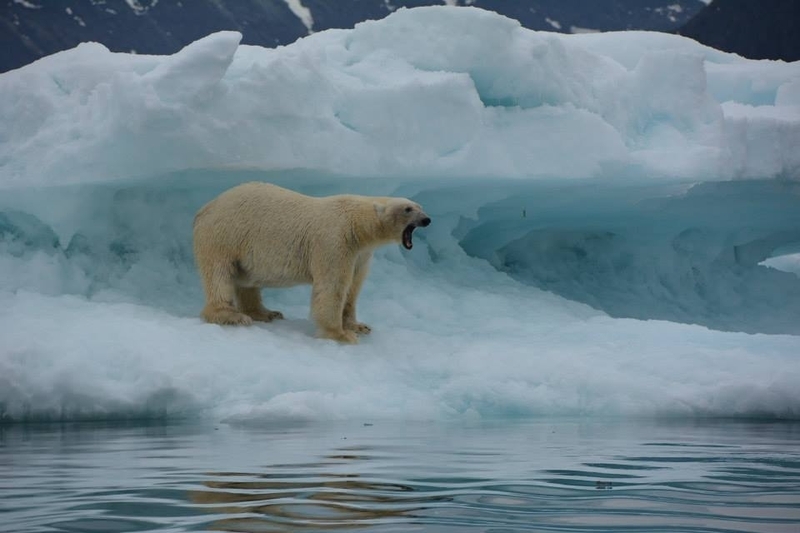 Mother bears will not stand for shoddy ice, and if conditions are not suitable along the coast of Svalbard, they will head several hundred miles in seek of the proper ice, and perhaps build a den along the coast of Franz Josef Land. 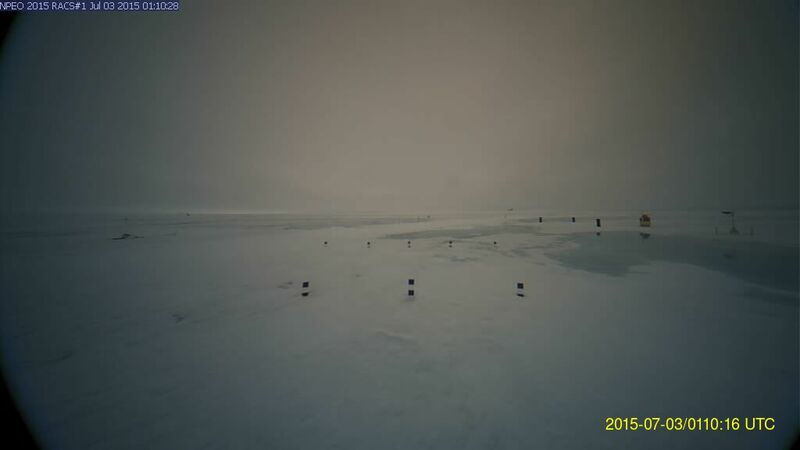 Then, if conditions improve by Svalbard the following year, they will head back. However such simple truth does not feed the cravings of the “cause”. The “cause” demands a tragic tale of no baby bears being born on Svalbard one year, and a pointing finger jabbing at nasty, nasty fossil fuels as the culprit. However who will be the scientist who will utter such nonsense? You need someone to make a Jon Aars of themselves, who will prove his compassion with a touchingly tender picture of compassion for a baby bear. 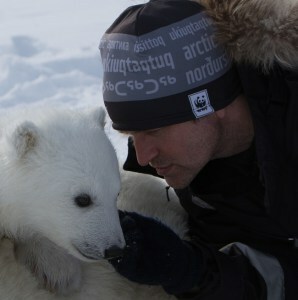 Ordinarily such nuzzling of a baby polar bear would be a quick way to get yourself killed. Where is the mother bear? Oh, I get it. She is laying drugged on the ice. 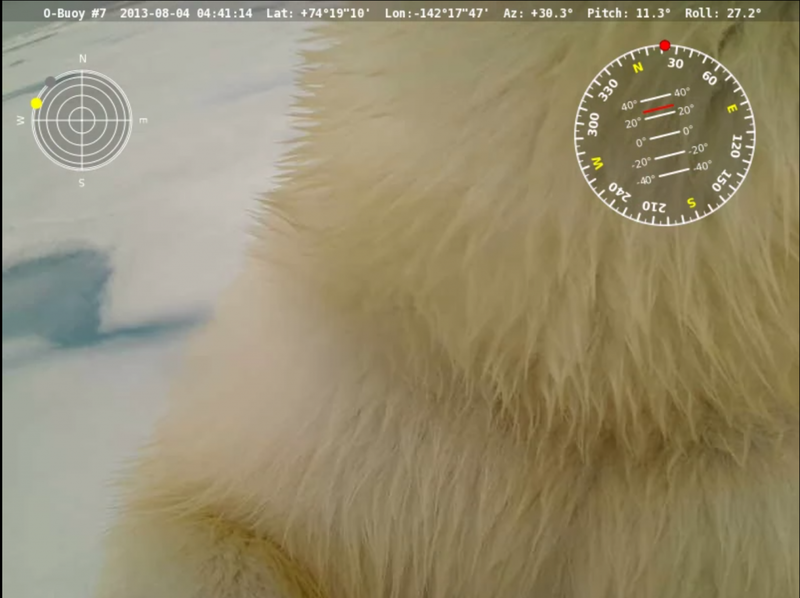 In any case, when the mother bears came back to Svalbard this year, Jon Aars had the decency to report the facts. Never mind that he got a lot of mileage, and caused all sorts of sobbing and a great increase in the consumption of Kleenex, a year earlier. However the people who live up there do notice. And they do care about their bears, even if it is only to usher a bear out of town. Such people know their own children are much cuter than polar bears. When it comes to the “cause”, their children come first. 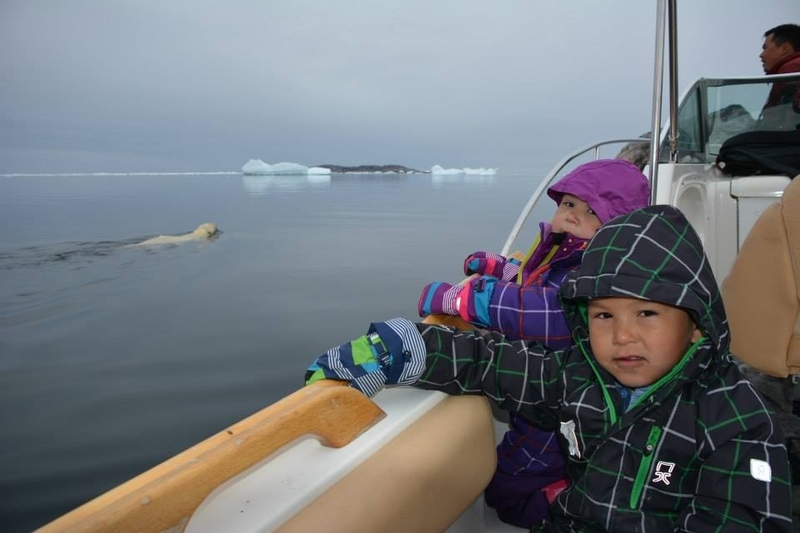 “Experience for example from Tempelfjord in 2013 shows that polar bears, including families with young offspring, do not necessarily suffer from frequent traffic. 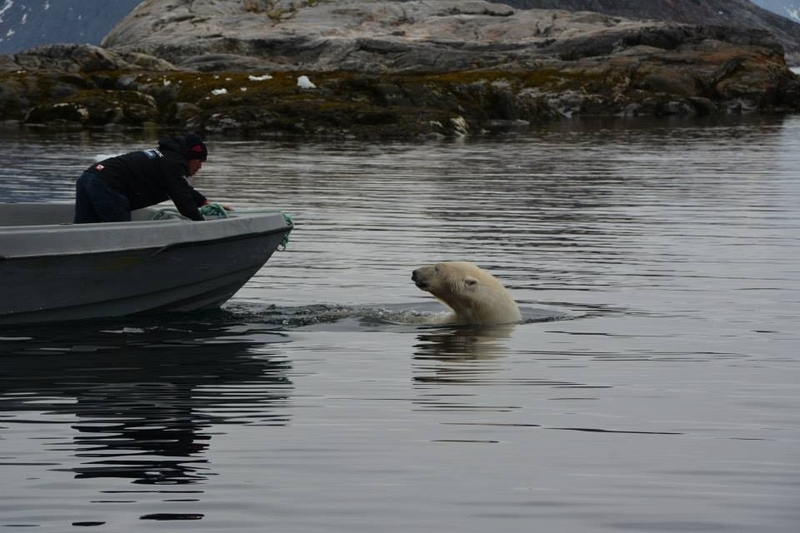 In that spring, a mother with 2 first year cubs spent several months in Tempelfjord, which was frequently visited by large numbers of groups. Respectful behaviour contributed to the well-being of the bear family, which was generally not visibly affected by traffic, but seemed to enjoy a good and healthy period, with regular hunting success. Unfortunately, both cubs from 2013 are most likely dead by now. 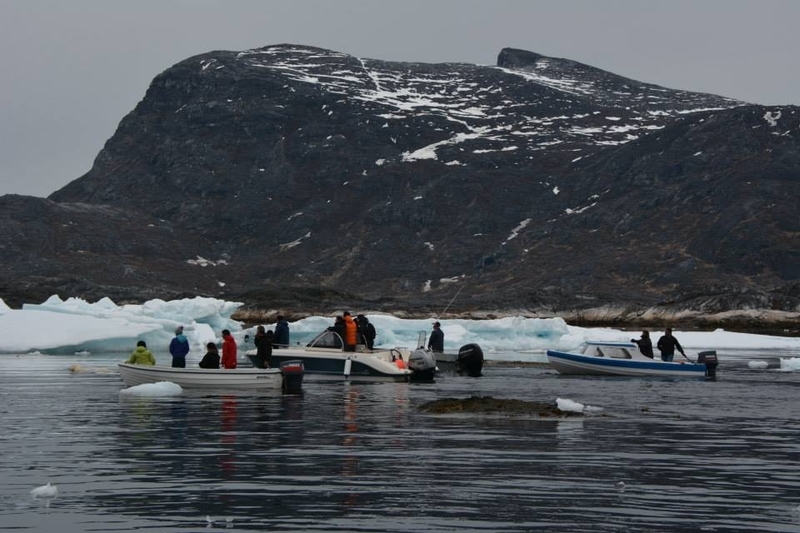 One died in Billefjord a short time after tranquilization for scientific reasons. There is no evidence for the tranquilization being the cause of the death, but the assumption is not far away. The second one of those 2 cubs was most likely the one that was shot near Fredheim in late March 2015 by tourists in their camp. The bear had injured one person in a tent and was then injured with several bullets from a revolver. It was later shot by the police. In conclusion, I have decided that back when I avoided the topic of polar bears, I had no idea of all the fun I was missing. 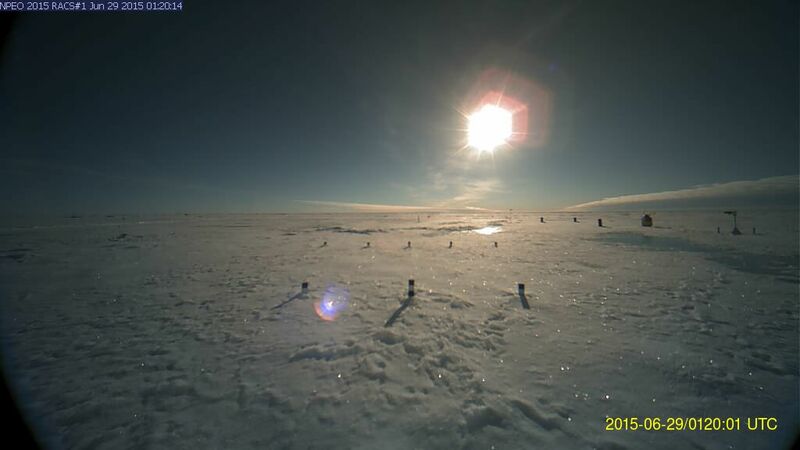 With sun arctic sun at its highest, and shining 24 hours a day, we are actually at a point where the Pole gains energy, albeit only a small amount. 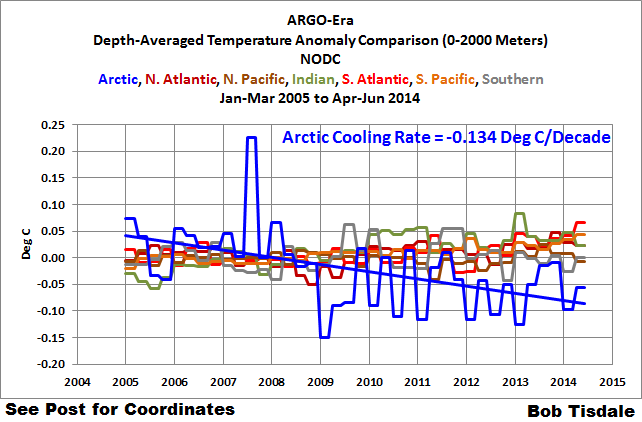 Therefore, in theory at least, the Pole could even be seen as a “source region” of warming, rather than cooling. In actual fact the Pole remains a source region of cool air, as there happens to be an ocean covered with bergs in the way of warming. Things might be different if there was a low, flat island (not 10,000 feet tall like Greenland or Antarctica’s icecaps) at the Pole, baking under the 24 hour sun, however that belongs to the realm of fantasy, and the reality is reality. 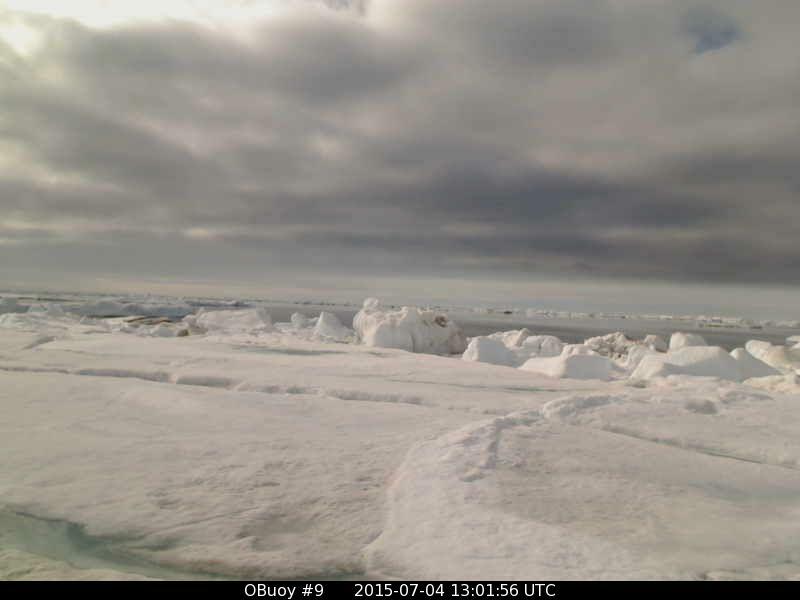 Besides the icebound ocean there are some other factors creating cold, or at least cool, air. A lot of heat gets gobbled up simply melting the ice into summer slush, as the available heat becomes latent heat in the phase change from solid ice to liquid water. Also any time it tries to snow or rain evaporative cooling may occur as the precipitation falls through the often-arid arctic air. Lastly, there may be heat lost from the tops of clouds through the tropopause to the stratosphere, as the tropopause is lower in the arctic,. 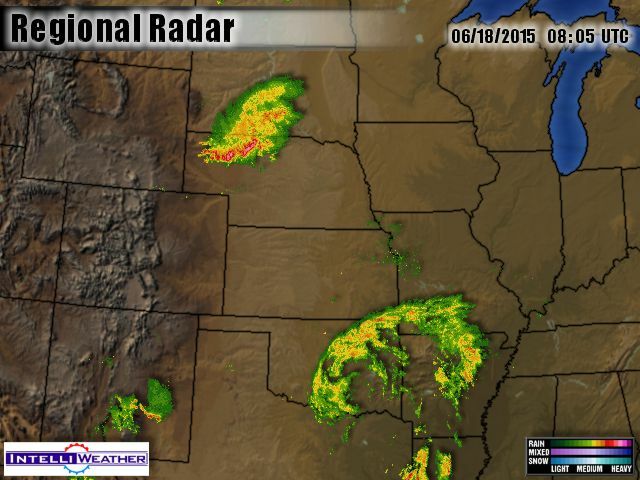 There is actually a lot of debate about whether or not storms lose heat. It might seem to be common sense, for when one thinks of a thunderstorm on a hot day it seems the storm obviously cools things down, but when it comes to doing the math it doesn’t add up. I myself have never been all that good at math, and have to take it on faith that it doesn’t add up, but I also keep scrutinizing the situation, thinking an yet-unobserved factor might be involved. (For example, a cloud has a flat bottom but a triangular top, so perhaps it has more upward-facing area with which to lose heat than downward-facing area to reflect heat downwards). All that being said, it does get quiet up in the arctic in June and July, as there are not the cold air-masses needed to clash with warm ones, to brew up big storms. While this may make things boring, it may also offer us a chance to observe subtle effects that are usually hidden or swept away by the powers of larger and more wintry storms during the ten months the arctic is definitely a cold-creator (or actually a heat-loser). I like to carefully watch the weak storms that drift about the arctic, and to watch the below-freezing temperatures they seem to create. Officially there should be no created cold with the sun so high and powerful, but over and over one sees the cold appear out of the blue. It is something to ponder. Currently a weakening storm I dubbed Klyuchi (after a small Siberian city) has drifted across the Pacific side of the Pole to the Canadian Archipelago, and the storm trailing it, dubbed quite logically “Trailor”, is being deflected south to a crossing route down near Being Strait. On the Atlantic side things are quiet, though something is brewing in the Baltic Sea and may come north later in the week. It seems to me Klyuchi did create some cold, as a few small patches of sub-freezing air have appeared even in the afternoon heat, on the Canadian side. 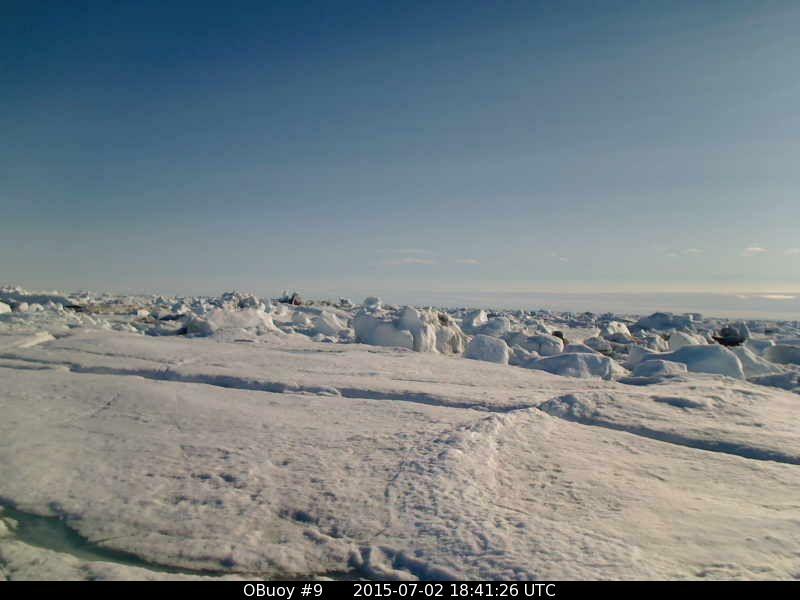 Although the sun never sets on the sun-baked Alaskan coast, it does get quite low at midnight, and temperatures at Buoy 2015A, which have been as high as +7.0° C, have recently dropped to -0.13° C.
North of there O-buoy 12 is exactly at freezing, with the melt-water pool at the left starting to erode at its edges. 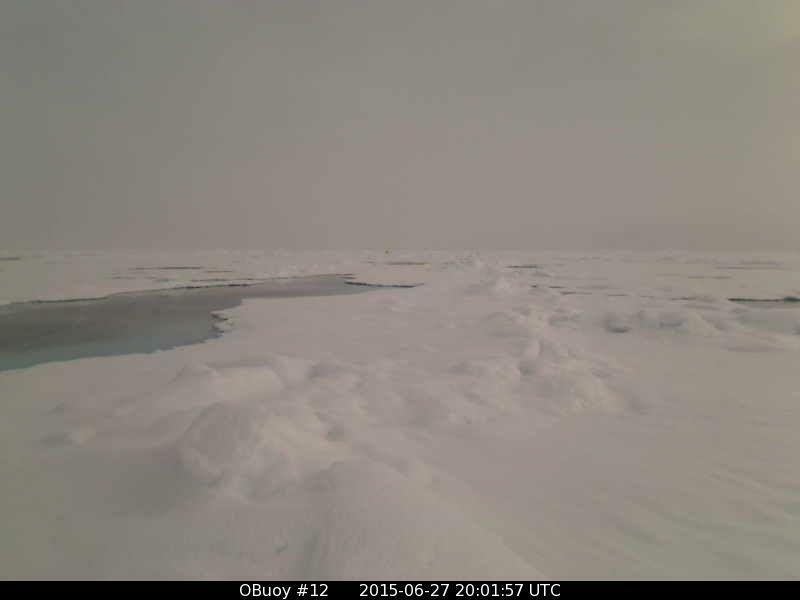 Back to the east across the Beaufort Sea O-buoy 11 is also exactly at freezing. It is interesting that these cold temperatures are all south of 80 degrees north latitude, and not included in the DMI graph of polar temperatures. Down off the north coast of Greenland O-buoy 9 is drifting east again, nearing 15 degrees longitude, and temperatures have briefly spiked above freezing. I am fond of Faboo, because it was the first camera I knew about. Years ago it introduced me into the mind-boggling reality of using my own eyes, rather than trusting the mainstream media, when it came to understanding the arctic icecap. 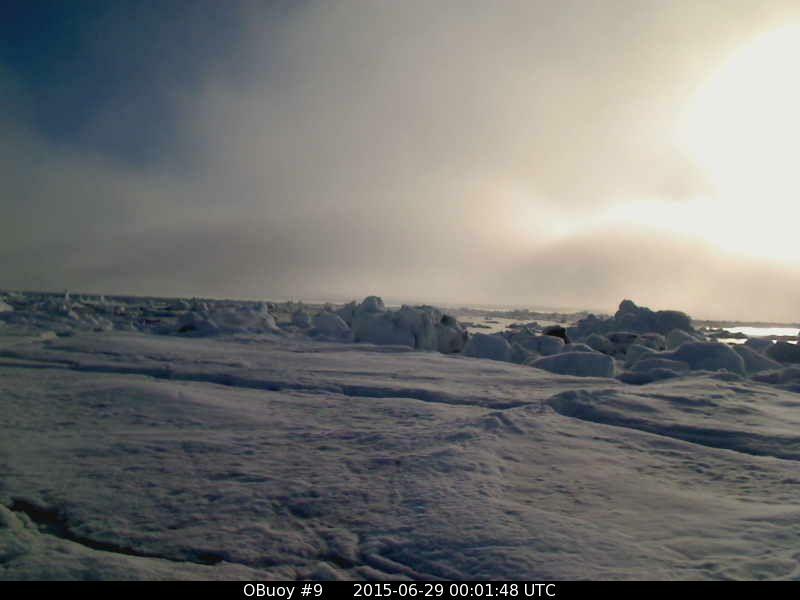 I am grateful to the people who created the idea of the drifting arctic camera, because when they created Faboo they created something unlike the media, unlike politicians, and unlike all too many scientists. When they created Faboo they created honest views. Faboo has continued to slowly drift southeast, but its speed has slowed as the wind slowed from a steady breeze around 10 mph to a near calm. It ended the last report (2100z June 22) at 86.961°N, 2.783°W, which is 3.3 miles further to the southeast, but still roughly 150 miles north-northeast of where we were at this time last year. Faboo’s temperature antics are a bit amusing, when you consider the fact temperatures basically stayed the same, varying barely more than a degree. Where I live there would be little fuss if temperatures varied between 74° and 75° Fahrenheit, but when that degree moves across the freezing point it makes a huge difference, especially if you are an Alarmist and feel a thaw is proof the North Pole is melting and the End Of The World is coming, but a refreeze means you are plunged into abject despair because the world isn’t going to end and you have to get a Real Job. In fact, each time Faboo quirks above freezing I imagine Alarmists wildly cheering, and then when it dips below freezing I imagine the cheering abruptly cut off. Mother Nature was toying with the poor Alarmists on June 22, for at 0300z temperatures were at -0.3°C, and at 0500z rose to +0.2°C, (wild cheering), but then at 0900z fell to -0.7°C (dead silence). Later, at 1500z temperatures were at -0.5°C, and at 1800z rose to +0.3°C, (wild cheering), but at 2100z had fallen to -0.6°C (dead silence). Of course, Skeptics can cheer in an equal but opposite way, and be just as silly. The way to avoid being emotionally jerked around by Faboo’s thermometer is to remember that temperatures are suppose to be above freezing at this time of year. In this way you don’t get all depressed about thawing, but every freeze is an unexpected benefit. On a more scientific note, it does seem the fading-away of Klyuchi on the Pacific side has made temperatures colder over there than they were. Faboo made it as far south as 86.960°N at midnight yesterday, but then edged back north and west, winding up at 86.964°N, 2.911°W at 2100z, which is 0.51 miles back the way we came. 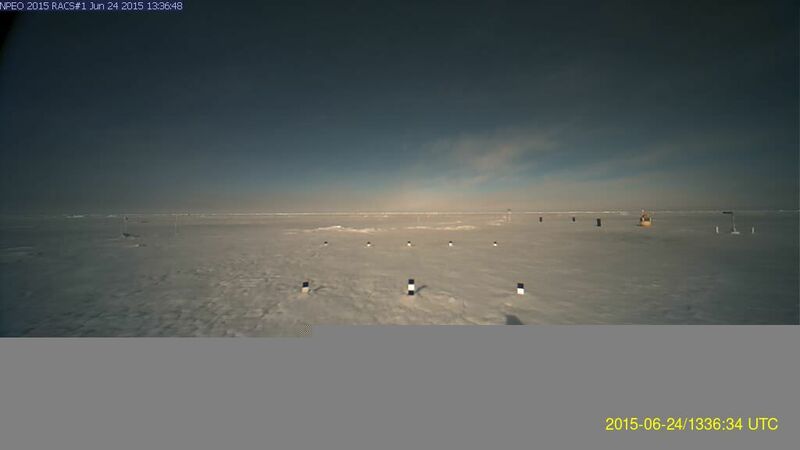 In the light southeast winds the temperatures nudged up to +1.0°C at 0900, before sliding back slightly to +0.6°C at 2100z. The light southerly flow exists due to a ridge of high pressure developing between the remains of Klyuchi and Trailor on the Pacific side, and a storm brewing up in the Baltic in the Atlantic side, which I suppose I’ll call “Balt.” Balt looks like it will weakly roam east along the arctic coast of Eurasia, and the high pressure will persist over the Pole, likely keeping Faboo from moving much for a while. 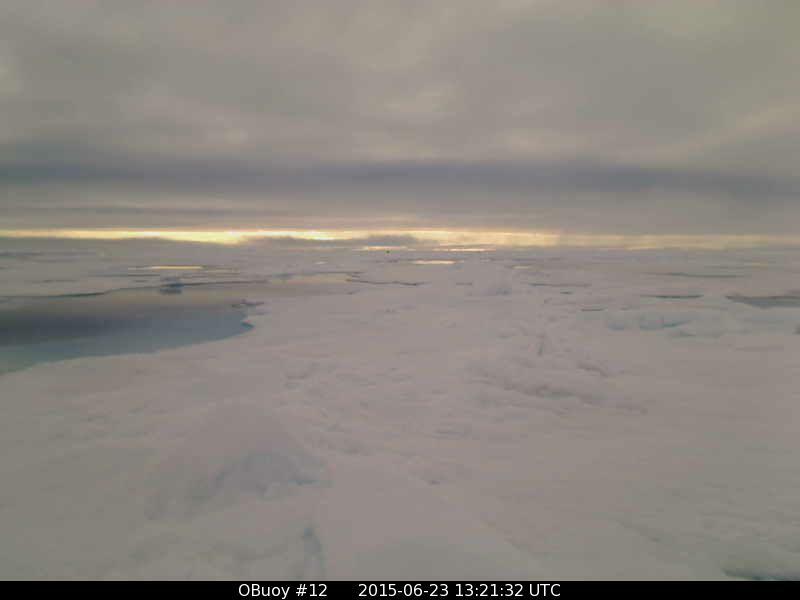 It seems the persistent gray weather at the Pole is at long last giving way to a more sunny spell. 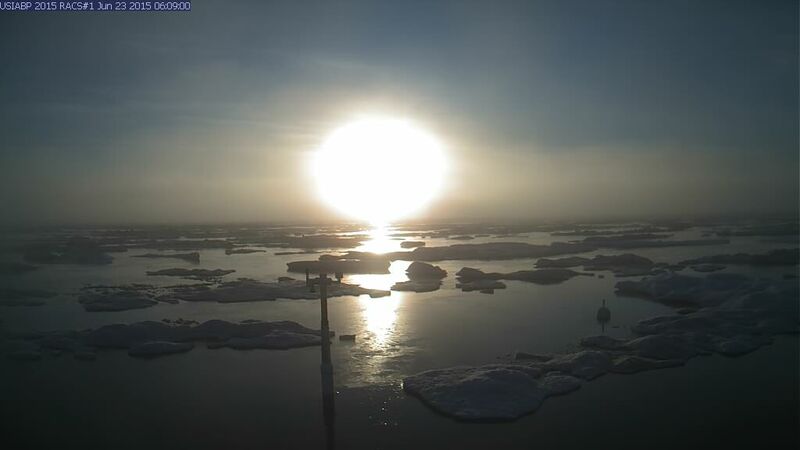 The low midnight sun is not warming much in the Beaufort Sea, likely because of clouds and possibly because of snow. It has warmed up on the coast of Alaska, with Buoy 2015A reporting +4.09° C, but once you head out to sea it gets colder. 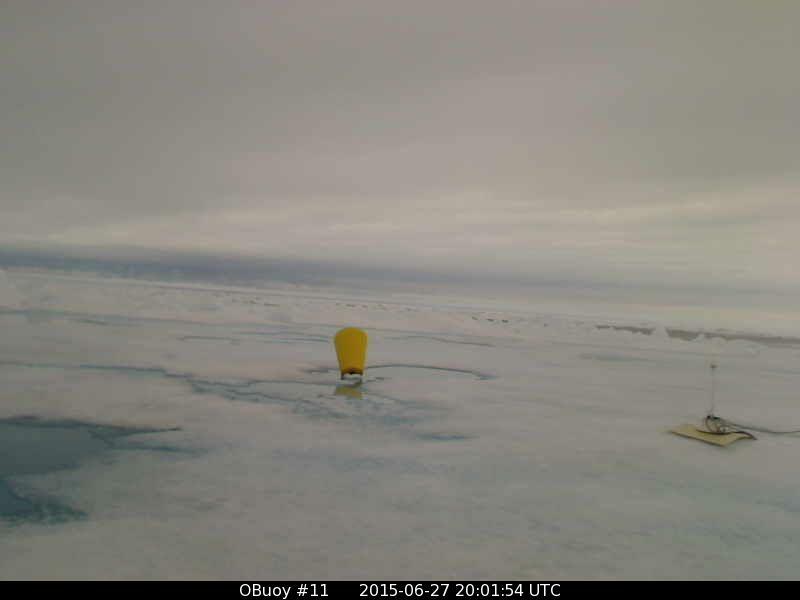 The only other above-freezing temperature is at Buoy 2014I: which is co-located with O-buoy 11, and shows it is just barely thawing at +0.03° C. The melt-water puddles are holding their own. At other buoys it is colder. 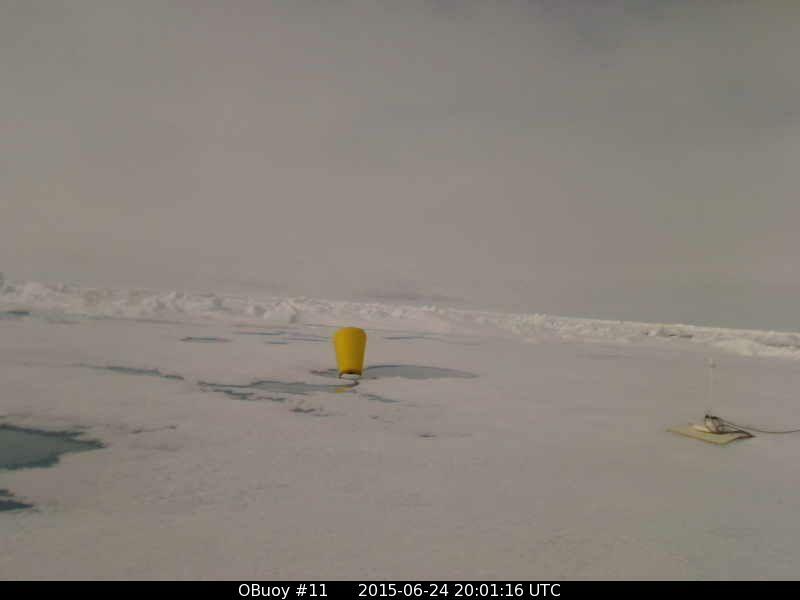 Buoy 2015B: is reporting -0.09° C, Buoy 2014G is reporting -0.79° C, and Buoy 2014F: is coldest at -1.33° C. O-buoy 12 looks like it might be experiencing some snow, with temperatures right at freezing. Considering we are well into the season of thaw, conditions seem a bit cold up on the ice. 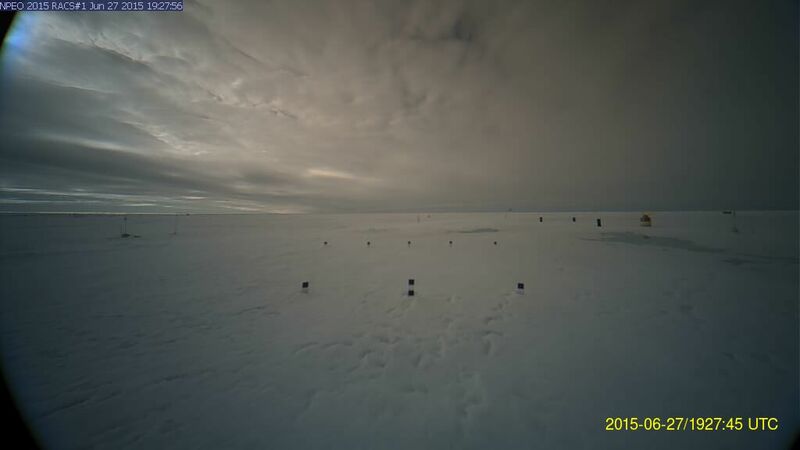 Perhaps once the low pressures die away on the Pacific side we can get back to sunshine and thawing, but at Buoy 2015E: , way down at 79.53° N, 0.84° E, at the edge of the ice in Fram Strait, it is -0.44° C, which seems to hint at a colder Atlantic. The morning map shows Klyuchi drifting down towards Hudson Bay, as Trailor stalls north of Bering Strait. Balt is slowly drifting up through Scandinavia. 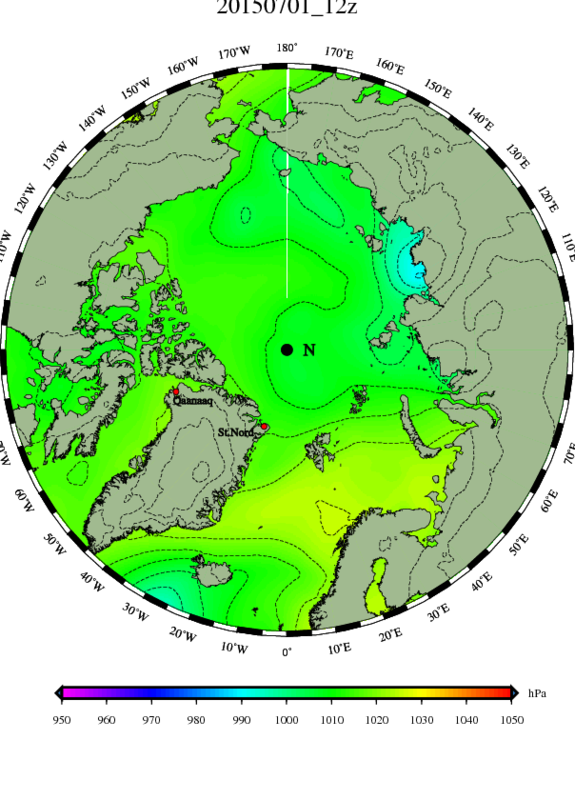 Between the lows is a ridge of High Pressure to the Eurasian side of the Pole, giving Faboo south winds and nudging the ice it sits upon back north. In these 0000z maps it is midnight down in Fram Strait, so you expect a bit of chill as the midnight sun sinks down to the horizon at 78° south latitude. but it is noon at the top of the maps, so you don’t expect the cold, sub-freezing temperatures towards the top, but there they are. When the wind shifts up at the Pole, and a huge area of ice stops moving one way and starts back the other way, you can expect pile ups and cracks and the formation of wide leads. 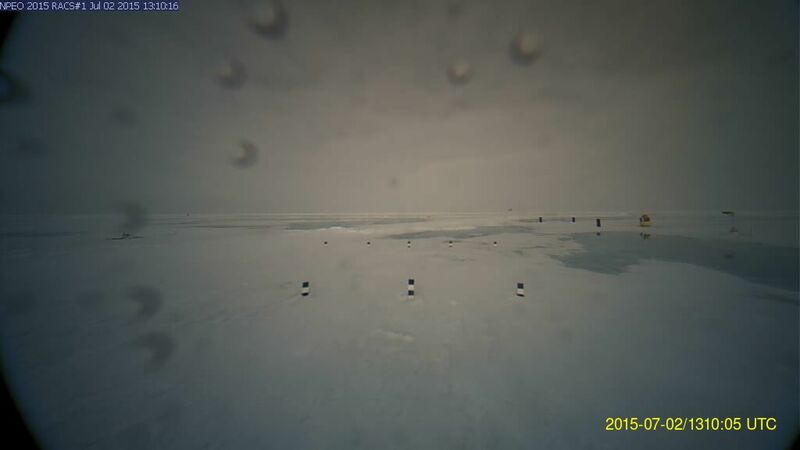 The ice still looks fairly solid in Faboo’s view, but there may be a thread-like line of sun shining on water in a lead on the farthest verge of the central horizon. The view from o-buoy 9 is far more dramatic, as a wide lead opened up. 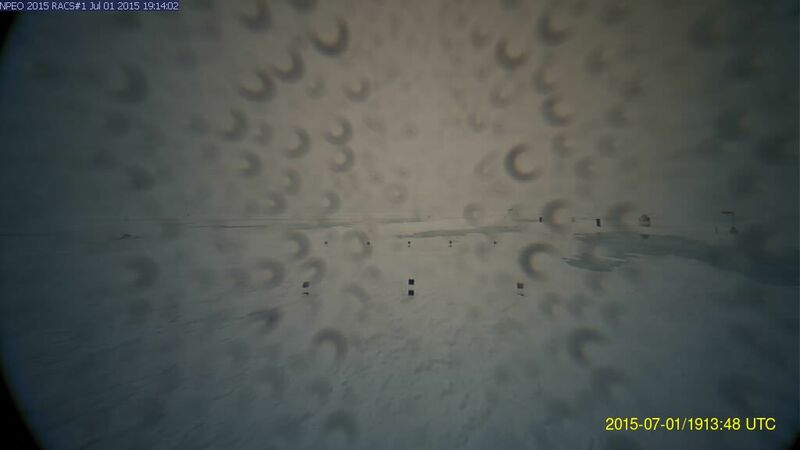 Apparently some the ice has continued on to the south as the ice our camera sits upon put on the brakes. Our camera here may be in danger when the lead closes and the ice slams back together again. Keep your fingers crossed. O-buoy 9 is still to the northwest of the final north-thrusting peninsula that Station Nord is situated on. Once we are past Station Nord we’ll likely head south. Currently the camera seems to have swung around and be looking more to the west than we were. 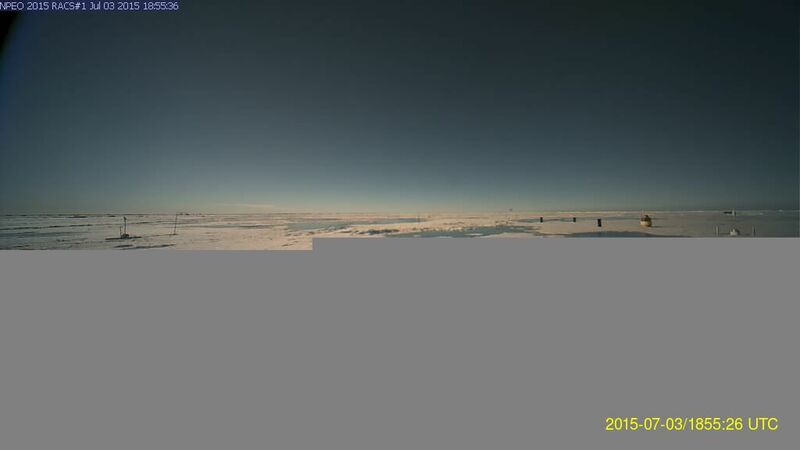 When we were looking due south we could see the mountains of Greenland passing in the distance. The unofficial update from the co-located Mass Balance Buoy tells us Faboo has continued to crunch north, and has reached 87.08° north. 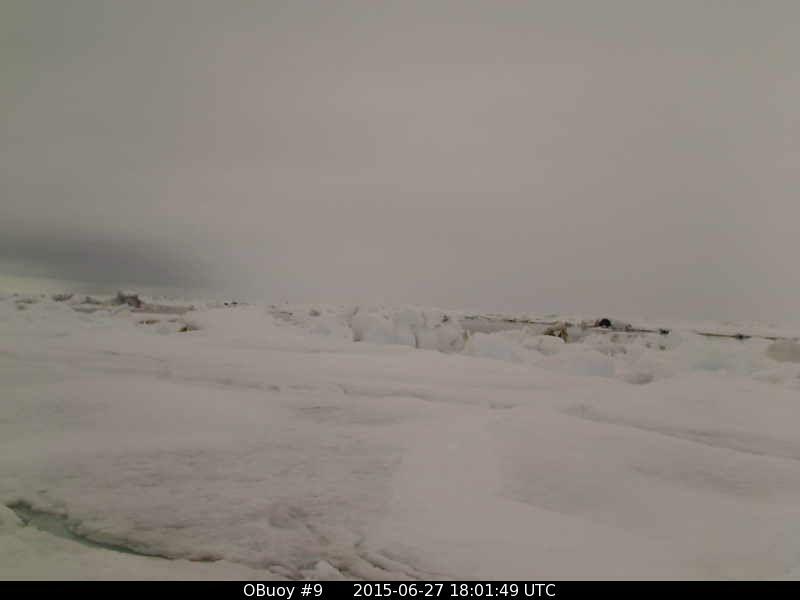 This is no easy task, when you consider how concentrated the ice is to the north. It is not a single berg drifting, but an enormous mass of ice that all has to be budged northward for any of it to shift. Temperatures have just nudged back above freezing, to +0.05° C, after spending roughly a day below freezing. The ice beneath Faboo remains 2 meters thick, and hasn’t yet started to show melting from beneath, though the snow has thawed atop the ice. 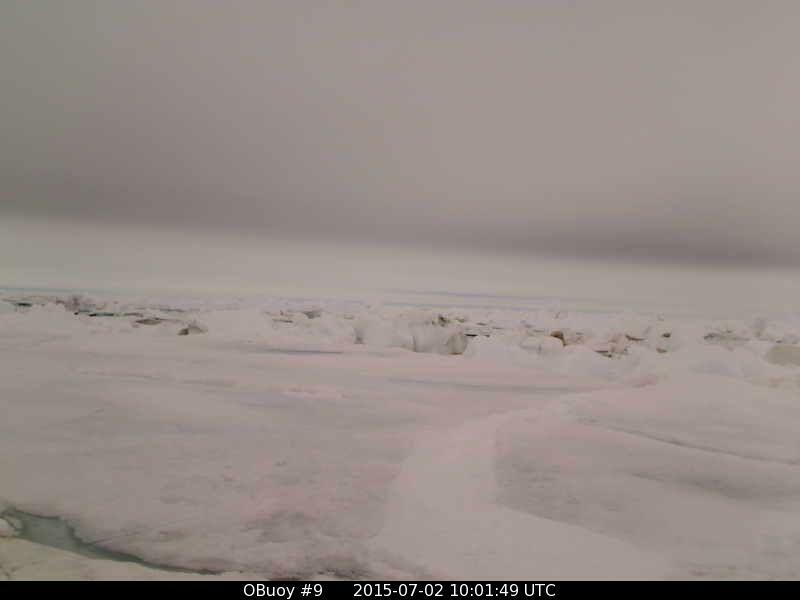 Klyuchi is down over Hudson Bay, with Trailer finally starting to fade into Alaska. Balt is drifting east across Barents Sea. High pressure still rules the Pole. A decent summer storm will prowl around south of Iceland, without going anywhere, for a while. With things fairly stagnant, the model runs vary wildly in what they see the future holding, because a small thing can make a big difference. If someone sneezes in Sweden the models total change their predictions. Temperatures seem to be starting to warm back up on the Pacific side. Of course, it is noon over there in the map below, and midnight down in Fram Strait. 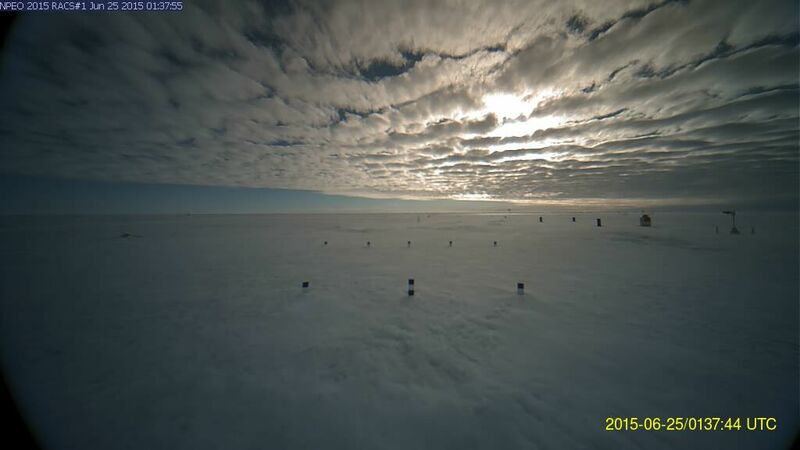 Things grew all gray again for the past 24 hours at Faboo, but a gray sun is now peeking through. Over in the Beaufort Sea O-buoy 11 is showing temperatures at +0.10° C, but the melt-water pools aren’t expanding much. The yellow trash can seems to catch sun and create its own pool, and is starting to tilt more. 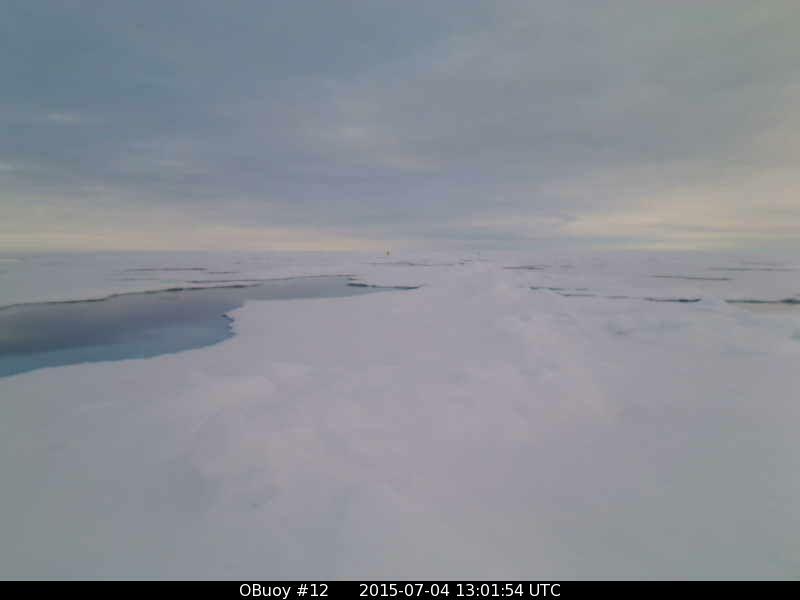 Furthest west, O-buoy 12 is resuming its thaw, but its melt-water pools hold slush from recent snow. I’ll likely conclude this post with Faboo’s official report, tonight. Likely it will show we made very little progress at all, towards Fram Strait, the past week. The evening report is in, and it shows that as of 2100z last night Faboo had regressed to 87.060°N, 2.391°W, or 4.57 miles to the northeast. In fact, when you consider that back on June 18 at 1200z Faboo was at 87.056°N, 4.765°W, it becomes apparent we are dealing with a serious backslider here. In an entire week we have not made a bit of progress south, and are in fact .004° north of where we began. Now I’m sure some of you well tell me to be gentle, and will point out that over the past week we did progress 8.4 miles, but it is to the east. Others will hasten to point out we did make it down to 86.960°N at midnight on the 23rd, but that makes the backsliding look all the worse. And while I hate to sound harsh, the unofficial Mass Balance Buoy report suggests we are continuing in the wrong direction, and are up past 87.090°. 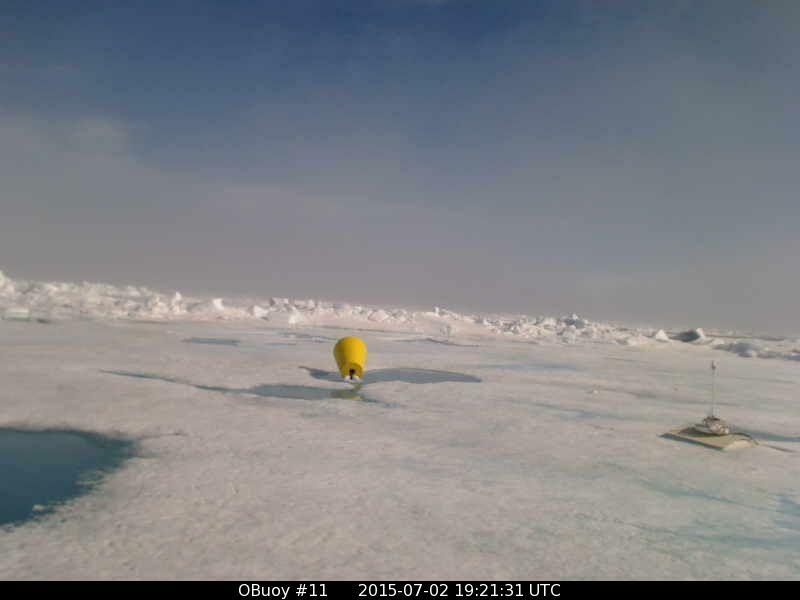 At this point it seems Faboo will lose the race to Fram Strait, and will suffer the humiliation of being beat by O-buoy 9, which actually began its journey on the other side of the Pole. It currently has slowed, but still seems to be grinding east along the north coast of Greenland. The lead that had opened and was wide seems to now be crunching shut. On the Pacific side “Follower continues to weaken, as a follower of Follower, hence “Folfol,” appears in the Laptev Sea. “Balt” continues to nudge west towards the Kara Sea, but the lows are rather lazy, and none seems to want to budge the high pressure from the Pole at this point. 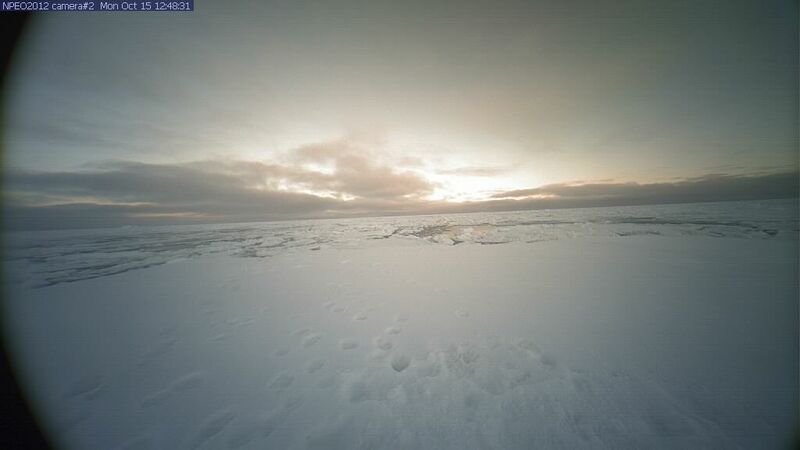 As the sun dipped down to a midnight sun low on the Pacific side, some sub-freezing temperatures did appear over that way, All in all it seems the Quietude will continue, unless someone gets up there and gives that sea-ice a good talking to. As I am a bit busy this weekend, I elect you for the job. It’s the longest day of the year, and even with the remnants of tropical storm Bill passing over this morning, with a lovely drenching the parched soil craved, there was a sort of thirst in the moist air. The sun beat down on even the purple morning from the highest the sun ever gets, and even the rainy day was bright and warm like winter never is, and yet the thirst still thirsted. When I thought about it, I was uncertain if the thirst was for even more light, or for less. In one sense there is never enough summer, and never enough light, and it creates a sort of anguish to know that starting tomorrow the days get shorter. It is like seeing the first fine wrinkle on the face of a young beauty, and knowing of mortality. On the other hand, when the Light is at its most intense one seeks the shade. One gets shy, and hangs back in the shadows. Winter makes it easy to yearn for the Light, for all is dark. In a sense winter is like singing in the shower, far from the spotlight. It is quite a different thing to step out into the Light on the longest day, when the Sun King is ruling. The longest day has ended now, and a muggy night has fallen, but even in the starry dark there are still flashes of heat lightning on the horizon, and a moth battles against the screen, continuing the theme of an attraction towards, and a repulsion from, brilliance. 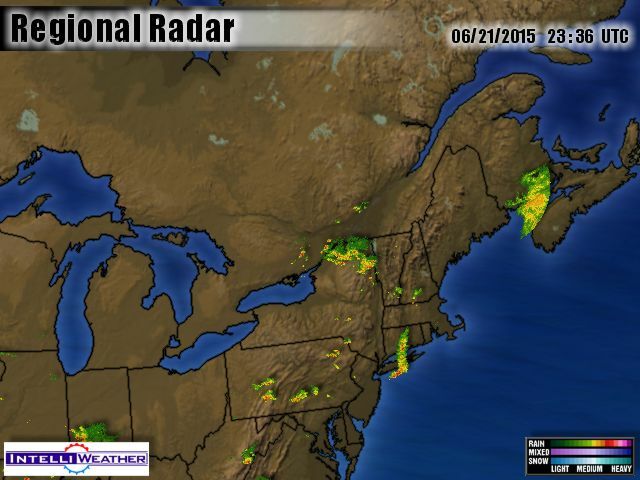 The lightning has faded away to the south, but now there are new flashes far to the north in the night. I feel surrounded by the Light, even at night, with this lightning creeping around the edges of the sky. It isn’t entirely comforting. The sweet shadows of sleep have fled, and brilliant insomnia stalks the hallways of my mind, restless, thirsty, relentlessly dissatisfied. I think when I was younger I could simply bury myself in work, and delay the issue into some distant future, when either I would see the Light or I wouldn’t, but heck if it was something I had time to worry about today. Today was the work, the job, the project, the Great American Novel, Chapter One Page One. But now I’m sixty-two, and my truck is twenty-one, and my rider mower is twenty-five, and during the past ten days all three of us had problems, and it was hard to get anything done. It was hard to bury myself in work when I couldn’t even start to work. However they had to order the parts, so I was without a truck. However at least I could bury myself in the work of mowing the grass at the farm-childcare, however I hit a huge, round cobble a child had decided to secret in a clump of grass about three minutes into the job. I didn’t wreck the blade or the pulley or belt, but the spindle and bearing, where it goes through the deck, which is beyond my capacity to fix, so all I needed to do is load the mower onto my truck and bring it to…but wait…I don’t have a truck. So I had to get the guy to come and pick the mower up, but at least I could bury myself in the work of hoeing and tilling and planting in the garden. However I’m sixty-two, and stuff I once could do in a flash now gets done as slow as molasses. Rather than a sense of weary satisfaction I wind up wanting to fire myself, and aggravated as hell. I was working as hard as I could, but falling farther and farther behind in my planting. What I need to do is to sell a hit song, and become a one-hit-wonder. Then I can afford to hire some strong young man, and to wear a white suit like Mark Twain, and sip mint juleps in the shade. However I’m so far behind in my planting I have no time for writing. I don’t much want to face the real writing, which is on the wall, quite yet, as I fear the writing on the wall will say I “have been measured and found wanting”. So I usually avoid the entire subject by withdrawing into the cooler world of blogging about sea-ice. However June tends to be a particularly boring month at the Pole, so eventually I have to stand and stare into the darkness. Sooner or later all that this world has to offer fails to distract us any longer, and even if we lack the wisdom, wealth and many wives of Solomon, we wind up seeing the emptiness of Creation, and saying, as he did, “Vanity, Vanity, Vanity.” And then we either seek a prescription for lots of antidepressants, or we turn from the shadows of creation to the Light of the Creator. This is actually what religion is suppose to be about, though most modify it to a degree where it is more less unrecognizable, and people become engrossed in blowing each other up, and other loving crusades. If people actually think about the Creator, it is like singing in the shower, and is timid and private, and never steps out into the spotlight and belts out The Song. The fact of the matter is that most of us know next to nothing about the Light. We know much, much more about the shadows. Yet people talk with great authority about the Light. For example Christians insist the One Life consists of a single lifetime, and Hindus insist the One life consists of many lifetimes, yet when you cross-examine both, neither can remember much about this lifetime, before age two. In other words, they are talking through their hats. They have no first-hand-experience they can access. As far as I’m concerned, maybe the Hindus are right, and maybe when we Christians talk about “everlasting death” we are talking about reincarnation, for wouldn’t that involve dying over and over and over and over again? And who the heck wants that? Dying once seems enough for me, so I’ll look for a way to avoid dying twice, if it is a door to Light I dare open. However we have little first-hand experience of what happens after death, either. When you talk heart-to-heart with believers you discover they may have faint glimpses, glimmers in the dark, that may have occurred to them when people they were very close to passed away, however these experiences are so tenuous most are reluctant to even bring them up, because they are delicate, private, intimate, and a little bit frail, and likely couldn’t withstand the cruel batterings of a ruthless psychiatrist, who would belittle treasured belief away with contrary thought into a mere hallucination. But death is not a hallucination. It happens, not only to people I love, but to my own body in slow stages and degrees. I may be tough for an old coot, and still have stomach muscles where by pals have flab, but there is no getting around the growing weakness in my efforts. Where I used to carry grain bags two at a time, I now carry them one by one, and huff and puff like I never did before. Even on the longest day of the year there is a lengthening shadow. Perhaps that is a gift given to the old: The ability to see the things of this world are shadows. For example, even if my writing brought me fame and fortune at this late date in my life, I doubt it would flatter me into making a complete fool of myself, in the manner Hollywood stars and starlets get fooled. It is simply too late. Some things lose their appeal as the drafts of death waft the curtains. One does not brush their teeth on the steps to the noose. The unnerving thing about shadows becoming more obviously shadows is that the Light becomes more obviously Light. All my life I’ve preferred singing in the shower, and been shy about stepping out into the Light, but as the end approaches there is nowhere to run, nowhere to hide. Come of all this toiling. Of the Why and the bright promise. Astound me like Doubting Thomas. Has this Jack getting grim. Plundering bandits sweep sabers of greed. Earn but coughs they deserve. But the thorns last all year. When God’s love is near. Though the roses are brief.